Over the past couple years, I’ve made many different vegan cheeze sauce recipes. The initial ones weren’t what I would consider spectacular, but with trial and error I’ve made recipes that not only satisfy my cravings, but make me crave the new recipes instead of actually craving cheese itself. As a former cheese addict, this is big. Last year, I fell in love with cashew-based vegan cheeze sauces. 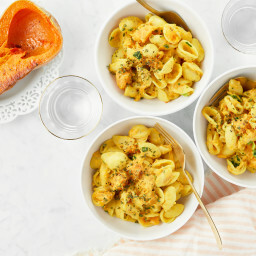 When you blend or process cashews with nutritional yeast, herbs, spices, and almond milk, you get this thick and creamy vegan cheeze sauce that can be added to macaroni, casseroles, spread onto sandwiches, and more. 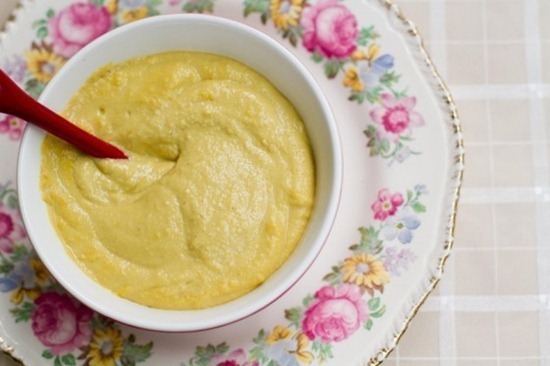 This below, is my favourite Cashew-Based Vegan Cheeze Sauce (without the squash). Lately, my focus has shifted to sauces that I can make without cashews. The cashew-based sauces are delicious, but they can be quite heavy. I’ve been working on sauces that can be thrown together in just a few minutes on the stove top. My first attempt was my 5-Ingredient Cheeze Sauce. Just almond milk, Earth Balance, flour, nutritional yeast, and S & P.
Some of you asked for a version that didn’t have as much fat in it. This recipe has 4 tablespoons of Earth Balance, but I knew that I could make it much healthier and lighter with a little work! This weekend was cold, wet, and gloomy, and it was the perfect weekend to make some comfort food. I decided to make a lighter Butternut Squash Mac ‘n Cheeze. But of course, I wasn’t so sure if it would work. I figured there was a good chance I’d be eating bad mac ‘n cheese for a week straight while Eric ate cereal for dinner. But it’s always good to hang onto a glimmer of hope. I roasted a Butternut Squash, but if you want to save time you can always used canned squash as an option. Preheat the oven to 425F. Start by slicing your squash in half (try not to slice your finger off like I almost did). I used a 3.5 pound squash for this recipe, but you only need 1 cup of cooked squash for the sauce (I had 4 cups of squash leftover, fyi). Scoop out the seeds & guts with a spoon. Peel the two halves and chop off the top and bottom. Slice into 1-2 inch chunks. Add the chunks into a large casserole dish or roasting pan. Drizzle on extra virgin olive oil and mix well with your hands. Now sprinkle on a hearty dose of Herbamare or kosher salt and freshly ground pepper. Roast, uncovered, for about 40 minutes at 425F or until tender. Again, you can skip this roasting step and use canned squash if you are crunched for time. Meanwhile, prepare the cheeze sauce on the stove top by whisking together Earth Balance (I cut the fat by 75%! 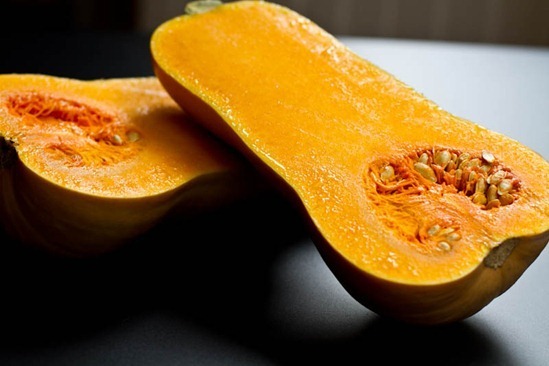 ), unflavoured almond milk, nutritional yeast, arrowroot powder (or cornstarch or flour), Dijon, garlic powder, S & P.
If you roasted your squash, blend 1 cup of squash with the cheeze sauce in a blender. If you are using canned squash, you can just stir the squash directly into the pot. The outcome was incredible. Thick, with a believable cheese flavour. Best of all, it’s quite low in fat, full of nutrients, and easy to make. The sauce makes enough for 4 servings of Macaroni (I used brown rice elbow macaroni). I stirred in a bit of leftover roasted squash too. This recipe is definitely “in the vault”, as we like to say. Eric was crazy for this mac ‘n cheeze and he’s a big cheese lover so I take that as a compliment. Brownie points earned. Creamy, cheesy, comforting—and healthy, too—what more could you want from a pasta dish? The original recipe was posted on my blog way back in 2011, and it quickly became one of my most popular recipes. I've now tweaked it slightly (mainly, streamlined the directions and added more flavour to the sauce), and I think it's better than ever. We just can't get enough! If you want a super-fast weeknight option, feel free to use canned butternut squash purée in lieu of the roasted squash. Preheat the oven to 425°F (220°C). Line a large baking sheet with parchment paper. 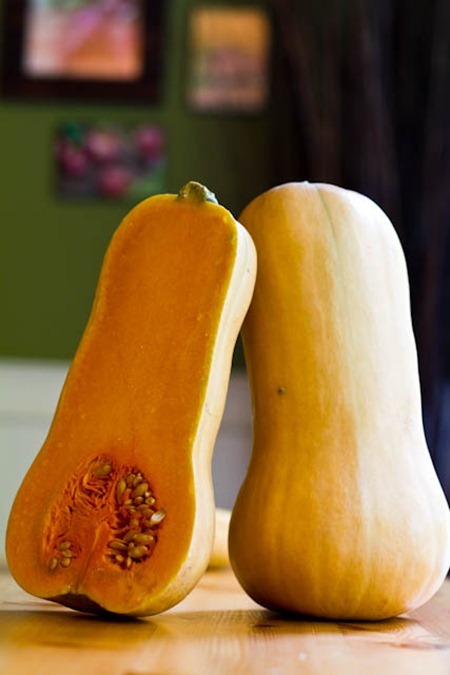 Lightly spray or brush the oil onto the orange flesh of each squash half. Garnish with salt and pepper. Place the halves cut-side down on the baking sheet. 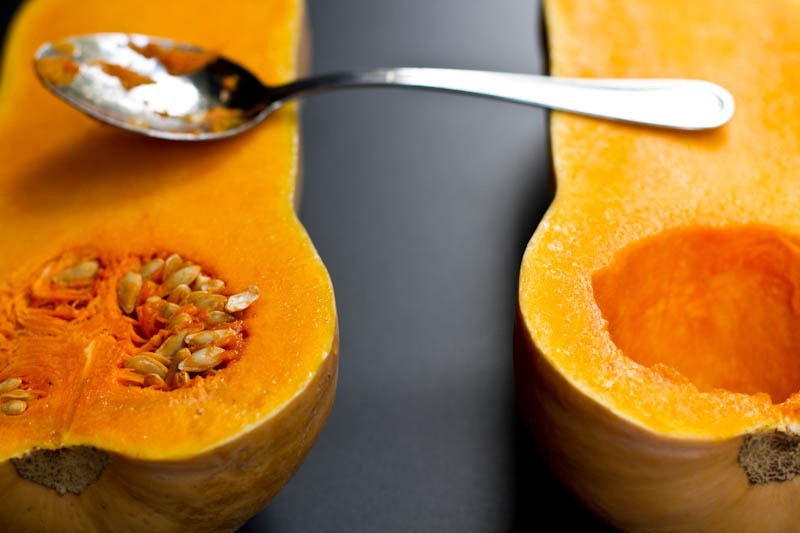 Roast for about 35 to 50 minutes, uncovered, until a fork or knife easily slides through the squash. The skin will be lightly browned and the squash may be brown in some spots (which only adds to the flavour). When there are about 20 minutes left of the squash’s roasting time, cook the pasta according to the package directions. Drain. After the squash is finished cooking, flip it flesh-side up and let it cool for 10 minutes or so before handling. 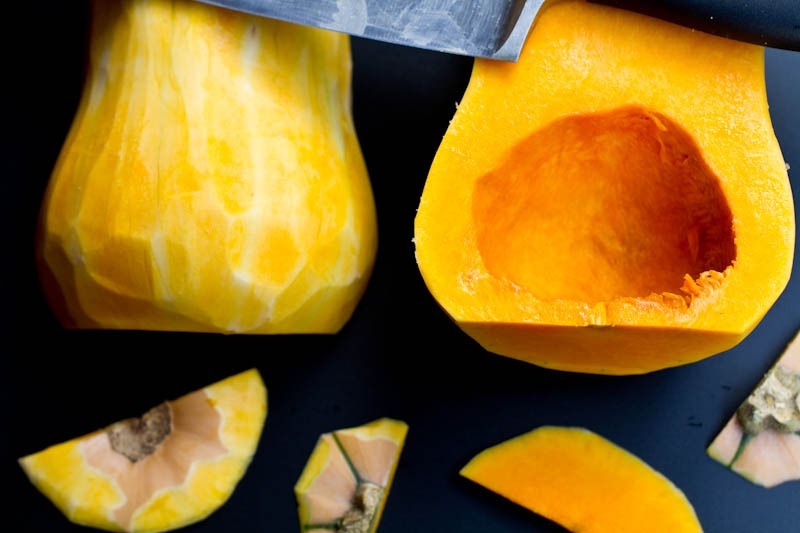 Into a blender, add the cheese sauce ingredients (butter, milk, starch, nutritional yeast, Dijon, garlic and onion powder, lemon juice, salt, pepper, and miso) along with 1 lightly packed cup of the roasted squash (simply spoon it out of the skin and measure). Blend on high until smooth. Add the cooked and drained pasta back into the pot and stir in all of the cheese sauce. Chop the leftover squash into small cubes, scoop the cubes out of the skin, and add them into the pot (along with any other mix-ins you like). Heat over medium and stir until thickened. Add more salt and pepper to taste (and more lemon juice if you want a bit more brightness). Serve immediately. * For a quick and easy option, swap the roasted butternut squash for 1 cup of canned butternut squash or pumpkin purée. It works well and is great for time-crunched weeknight meals. Instead of roasting squash halves, you can save a bit of time by purchasing pre-chopped fresh squash, too. ** You can probably substitute the vegan butter for a light-tasting oil, such as grapeseed oil or refined coconut oil. Make it nut-free: Use a nut-free plant-based milk. Just be sure it's unsweetened and unflavoured. Notes: 1) My 3.5 pound squash made 5 cups cooked squash, so I had about 4 cups leftover. 2) The sauce does not cut in half well (the blender has a hard time blending it up), 3) I tried this recipe with canned pumpkin and it was awesome! 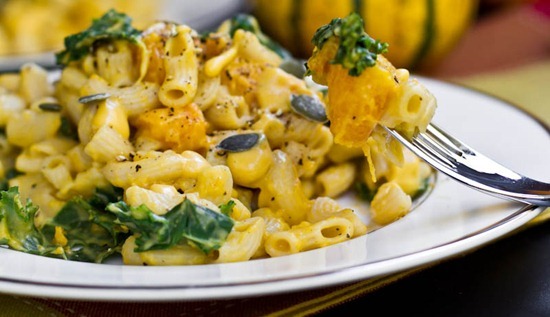 PUMPKIN Mac ‘n Cheeze. I’m so going there. When the heck is it going to stop raining? Can’t wait to make tonight with fresh butternut from garden. THANKS SO MUCH for recipe Angela! So creative. Angela, i would like to add the Kale to it. Do I need to cook or prep the Kale of just take and fold in raw Kale? Looking forward to this dish tonight! Depends on your preference I’d say. Also depending on the size. If you cut it up, you can probably just throw it in. If you like big chunks of kale (yum) then I would probably heat it. 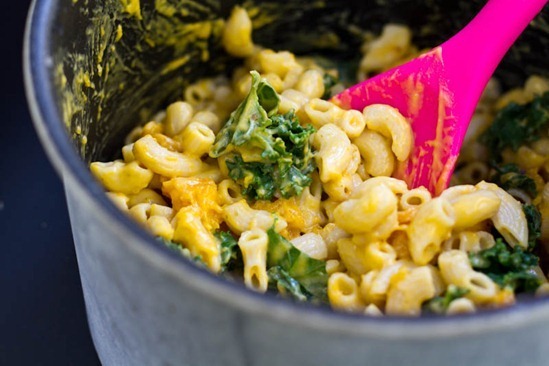 This can probably be done in water in the microwave or even if you add the kale to the mac n cheez while it’s still on the stove like she’s doing in the picture and stir (may need to turn it back onto a low heat for a bit), it should soften up quickly. Kim I’ve made it before and just folded in the raw kale. It turned out great! Kale is really great in this dish tossed in some salt and pepper and olive oil, and roasted in the oven at 400 degrees for around 8-10 minutes so it’s crispy around the edges like kale chips and tender in the middle like sautéed kale. If you add raw kale (even folded into the warm sauce end wilted) it tastes bland and bitter with an unpleasant chewy texture. You’ll want to de-vein and chop off the large stem that runs through the middle of the leaf and chop it into mouthful size pieces. What do you think of steaming kale and blending it into the sauce to make it green for St. Patrick’s Day? Do you think that would work? And would unsweetened rice milk work? LO is allergic to nuts in addition to dairy. I made this on my daughter’s recommendation. So glad I did. Eating right now as I am commenting. Added roasted broccoli. So delicious! This recipe is a keeper. Thanks for sharing. So mac n’ cheese (along with peanut butter toast) has become my staple on my bad chemo days. On top of that, I cut back on dairy and am always trying to sneak in vegetables when my stomach churns at the sight of a leafy green. You just made my day with this recipe. <3 you!! I will be making this asap! It looks amazing. this looks fantastic! i’m definitely going to have to try this one out on my kids! I live in China and have no access to nutritional yeast. I’m also soy free, so earth balance is off limits. I’m also allergic to garlic so that and the Dijon mustard are off limits. And with kidney issues, i cannot eat salt. I was so excited to try this recipe till I realized these things. Any suggestions? Thanks! You’re very creative! I would suggest buying the nutritional yeast online too :) Aside from that it sounds like you are going to have to get creative with spices. The Dijon gives it a kick so maybe try adding crushed red pepper flakes. Another reader suggested adding minced onion. I’m sure that would give it some depth too. Great suggestions Meg, I can’t think of anything you didn’t mention. I meant to add, the nutritional yeast is an essential ingredient (in my opinion) as it gives the cheese-like taste. Hi, Love this site – its very inspirational, thank you. Just to say I made a cheese sauce with coconut milk, nutritional yeast, and dijon for zing, some cornstarch if necessary and heated it through. Add more n. yeast to required taste. Great on roasted cauliflower or any roast veg. Sometimes you have to play with what you have in the cupboard :-) Enjoy good food and good health! EB has a soy free option as well (red writing on container) — but might be hard to find. Good luck! Earth Balance has a soy-free version – it is fantastic! i think they make earth balance soy-free now——and i use alot of ms. dash spices(salt free) they are yum! Hopefully you will see it there soon if you can’t find it now- I am soy-free as well and Earth Balance makes a soy-free version here in the states. I’m not even a big cheese eater (or cheeze – but I can’t say I’ve actually tried it yet!) and you had me sold at butternut squash! :) Can’t wait for the pumpkin version – although I don’t need any help turning myself orange hahaha! I can’t wait to try this (although I may skip the kale)! It’s been so cold here lately so I’m dying to make some comfort foods. I believe this shall go on the dinner table this evening! YUM! This looks delicious. I’ve been loving butternut squash. And your pictures are gorgeous! You have the BEST cheeze sauce recipes!! I just made pumpkin mac n cheese and my daughter loved it..Such a better alternative to the regular mac n cheese kids love! This butternut squash is next on my list for sure!! I’m going to try this out against my mac n cheese lovin hubby. I’d love a healthier “vault” recipe for mac n cheese that tastes legit! What is the purpose of the nutritional yeast? I have never used it before. and it provides some nutrition, too!! I just wanted to tell you that I made this last night for dinner and it was AMAZING!!!!! Definitely one of my all-time favourite recipes. I gave some to my hubby to sample and he had no idea that it wasn’t traditional mac n cheese!!! Angela! Again, you amaze me. This looks delicious! 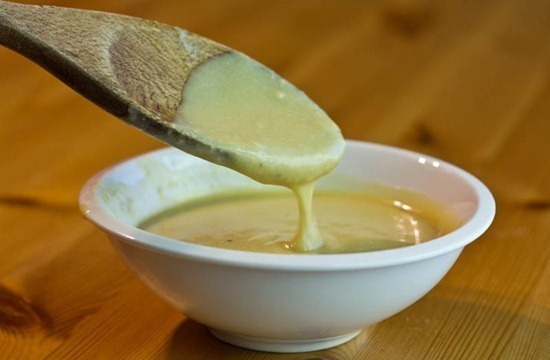 I’ve been meaning to get around to making a vegan cheese sauce to try and trick the fiance ;-) I’m a cheese addict also but I love to switch it up and try your recipes…they’re always crowd pleasers. Keep up the good work! wow comfort food to the max.. I might try this today, but first I have to do some googling to do, to see if green butternut squash is the same as the orange. I’m not sure if they grew on the same vine or just next to one another. We will see.. thanks for the recipe! Yum. I’m not a big squash fan, but I think I’m going to give this a try. I tried your Basic Cheez Sauce, it was good, but there was so much fat in it. Thanks! BTW, I only like pumpkin(love it), so I’m really looking forward to see if your pumpkin cheez sauce works out! This looks fantastic. The perfect fall mac ‘n cheese. I’ve made it before with cauliflower, but I love the idea of a squash! Yay! My man LOVES mac and cheese but we rarely eat it because its unhealthy and not vegan! But this looks so healthy and scrumptious (its making me hungry looking at your photos but at least my lunch is coming up lol) I will have to get some arrowroot powder and try this out- I’ve read about arrowroot being a great binder but havent ever used it! Mmmmmm, cashews are the best way to make things creamy, in my opinion. Then combining them with butternut squash is heavenly. 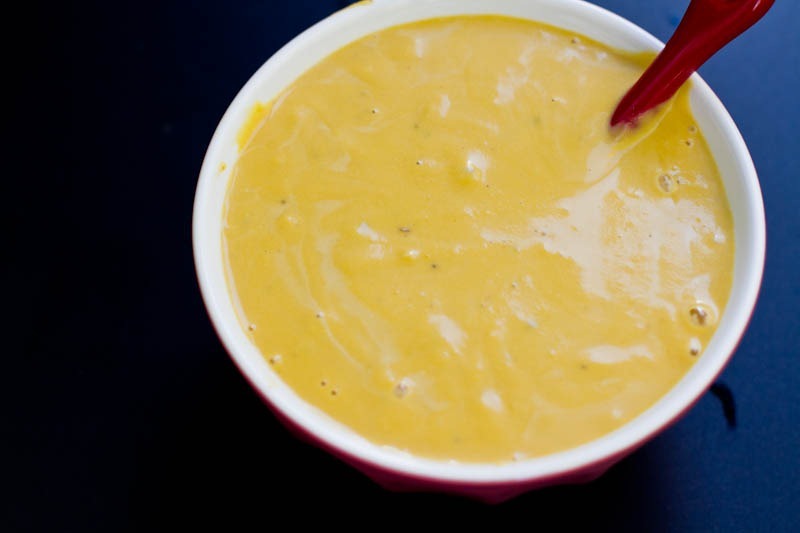 I just posted a butternut squash soup recipe that probably tastes similar to your sauce. It was gone almost the moment I took it off the stove! I’ll have to try out this mac n’ cheeze, I have a feeling it would be just as much of a hit! It’s raining outside and all I want is some comfort food. I think this’ll fit the bill!! This looks awesome! I was a little bummed when I first saw it because it looked delicious, but I was sure it had cashews in it (I’m allergic). Now I know I can make it nut-free, I’m ready to make it! YUUUMMMM. That looks so warming. Might try this with some traditional basil pesto in the mix. Butternut squash and pesto is one of my favourite combinations. And it’s going to stop raining in southern Ontario tomorrow! Sunshine for the next 5 days! Highs of 19ish! Life is good. I’m dying to try this. I love how creamy the squash gets! This looks amazing! my family will totally love this. 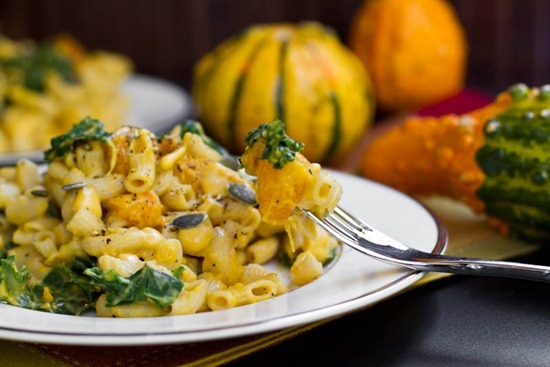 WE enjoyed the basic cheese sauce last week with pasta and veggies… know they will enjoy the buttery taste of the squash with it. I can’t wait to try this, and share this recipe with a client newly diagnosed with multiple food allergies! She wants a mac and cheese recipe for herself and her children … CAN NOT WAIT! i am always looking for twists on mac n cheese and this looks fantastic!! i just pinned it for future use :) love anything involving my beloved butternut. Your timing is perfect. I have been on a mac and cheeze kick for awhile now. I think your addition of the dijon is what I’ve been missing. Just made a cheeze sauce with chanterelles. Need to make another batch now with your recipe! This looks absolutely delicious! You are the queen of healthy comfort foods! I am a butternut squash fiend, but I find them to be a little labor-intensive. I’ve found it to be an awesome timesaver if I buy the biggest honkin’ squash I can find, peel, seed, chop it just as you describe, and then lay the chunks out on a cookie sheet (keeps them from becoming a giant frozen squash blob) in the freezer overnight. Then the next morning I throw the chunks in a container and I have them to use across multiple butternut squash recipes. My grocery store sells pre-cubed, pre-peeled squash chunks. I currently only make 1 or 2 dishes with it, so I prefer to pay a few extra dollars to save the time (not to mention my fingers or having to retrieve runaway butternut squash from the floor or the sink). I have never been a fan of squash, but these sorts of recipes really intrigue me. I might not like it by itself, but mixed with the rest of the ingredients? It could be amazing. Oooh the possibilities. is this the same or similar recipe to the butternut squash recipe posted last year? if so.. yay – so delicious!!! I would say it’s pretty similar, although not as heavy or thick. This recipe had me drooling! 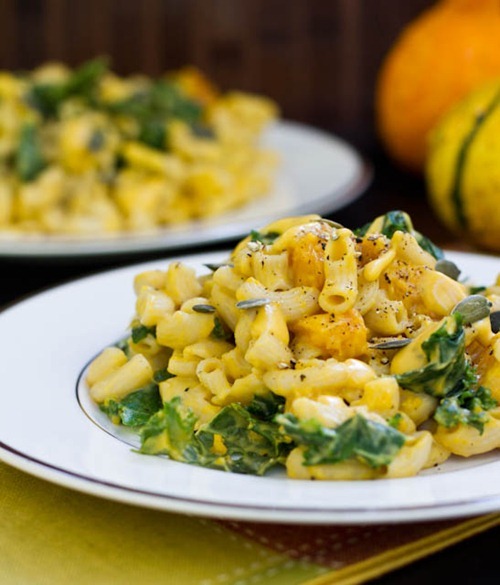 I love butternut squash so much and have yet to find a satisfying vegan mac-n-cheese recipe. I prefer not to use soy (many recipes use silken tofu) and I agree that the cashew cheese sauces can be very heavy. This recipe looks creamy and dreamy and amazing. It’s still in the 80s here in Colorado (seriously?!) but as soon as I feel a fall chill, I want to try this recipe! Thank you so much for this recipe Angela! I have a cashew allergy, so I’m always sad about the great vegan cheeses that I can’t eat. I can’t wait to try this one! Looks incredible! I have been wanting to try butternut cheez sauce for awhile. Thanks for reminding me to use up my squash. YUMMMM!! Can’t wait … it look D-Lish! Whoa! This looks so decadent and delicious. I love your blog! The only problem with removing the cashews is you are removing a big amount of PROTEIN from the meal :( If only there was a way to keep your recipe idea, but to increase the protein in the meal (’cause I know brown rice pasta isn’t as high in protein as other grain pastas, such as kamut or spelt)… Maybe making your cashew sauce but replacing the cashews with chickpeas? That would make the dish lighter, but upping the protein. As for this dish, maybe stirring in some chickpeas or other legumes just before serving would increase the protein content. Quick question, do you think this would work with rice milk? My son is an allergy induced vegan but is also alergic nuts. I love the vegan recipes, but they almost always include some sort of nut/tree nut product. yayyy so excited to try this! 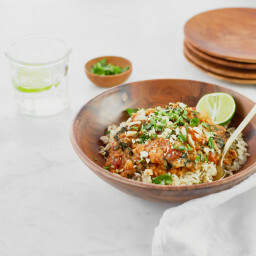 Thanks for the dinner suggestion- so making this tonight! I’m amazed at how perfectly cut (in half) your squash was! This looks like something I will definitely try this season! Oh yum – I made some roasted butternut squash soup at the weekend for the blog this week and have some leftover roasted squash, so I’ll give this a try. oh many, absolutely delicious. I just posted a recipe for pumpkin/ goat cheese sauce with roasted cauliflower. The cauliflower acts like macaroni, and it became an amazinggg substitute for mac n cheese. You really can’t go wrong with any combination of butternut squash and nutritional yeast. I’ve never made the cashew sauce because I don’t have a food processor…though I suppose you could use cashew butter. 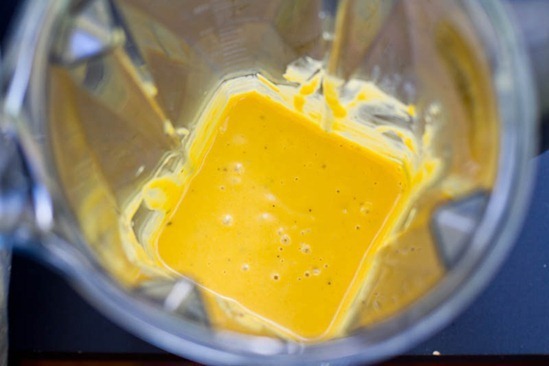 My staple “cheese” sauce is almond milk, nutritional yeast, curry, spicy mustard and cornstarch. This looks amazing! Do you think that it would have a good flavor if you made it with pumpkin as well? I would like to hope so! I hope to try it out soon. Hi Angela, this looks delicious! Do you know if it would reheat well though? I read somewhere that arrowroot does not reheat well and causes dishes to turn slimy (regardless of whether dairy products are included or not..). I’ve been wanting to try arrowroot, but since I usually only cook for myself, there are almost always leftovers! :) Being able to reheat them would be nice. Thanks! You are right that arrowroot can make sauces slimy! When I took this sauce out of the fridge, it was slimy and a bit clumpy. I popped it into the micro for 30 secs, gave it a good stir, and heated for another 30 secs or so. Stir, stir, stir and it was back to the same consistency and taste. I love taking old recipes and making them lower in fat. I’ve really enjoyed doing that over the last couple of weeks. It’s amazing how fast the fat adds up! Can’t wait for the pumpkin mac n cheese. I make something similar for breakfast with leftover pasta and pumpkin or apple sauce with a crunchy topping (quinoa flakes + cinnamon). Can’t wait to see what you come up with! Yes! That’s a great idea. I can’t eat corn, but I have made it with these guys a couple of times: http://www.enjoylifefoods.com/our_foods/cereals/crunchy_flax.html even almonds + pecans work too! This looks soooooo good! I’m not vegan but I bought nutritional yeast yesterday because I happened to see it and wanted to try it. IT IS SO GOOD. I am addicted! I’m glad you like it! It actually took me a while to learn to like the taste. haha that’s funny :) I’ve been known to do that with recipes too. This looks so darn tasty! Wow! Amazing Angela. 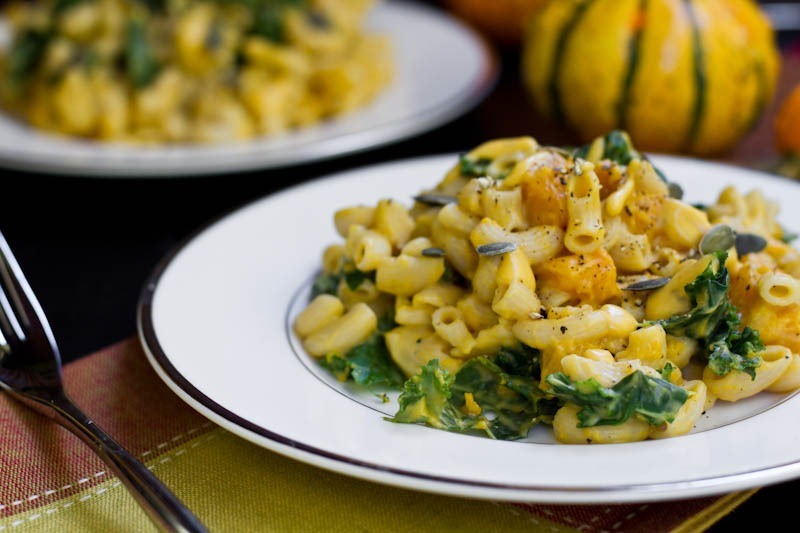 =) I am SO making this tomorrow w/ kabocha squash. Yummmy! I am going to make this with pumpkin tonight! I used to be a “blue box” fanatic. I love how easy and healthy this is. Definitely comfort food at it’s finest. Definitely going for it! I used to love the blue box too! Wow…I never would have thought that butternut squash, combined with so few other ingredients, could taste cheesy at all. My curiosity overwhelms me when I see the recipes you post. I’ll definitely be trying this one soon. I also told the boyfriend (who hates all kinds of squash) and he said he’d try it….I’ll let you know if he likes it! Thank you for the lighter cheeze recipe! I made the cashew-based cheeze and it is delicious but it does sit heavily and I could only have a few bites. You rock. Thanks! I love having pasta Fridays at my house, so I think this will be a perfect way to kick of the weekend. oh my – this looks delightful!!! just wondering if you can come up with a pumpkin cornbread recipe???? I made this for lunch today but I used a cup of leftover pumpkin that was in my fridge. I also added a tbs of white miso. It was fantastic! I stirred in spinach, topped it with breadcrumbs and baked it in the oven for 20 min. My 2 year old also loved it (although he left the spinach in a little pile in the middle of his plate). We will definitely make this again. I worked out the nutritional information and it has only 486 cal and 8 g of fat per serving not a bad way to indulge in Mac and cheese! P.S. Do you use the Organic Whipped E.B. or the Vegan? This is not about the recipe you posted today. I have been making your cranberry oat bars for my 1 year old for about 6 months. No kidding, one of his first words was “bar” to ask for them. Today I only had one banana, so I pureed about 3/4 of a cup of strawberries and replaced one of the bananas with that. I also used dried blueberries instead of the cranberries, and cut back on the sugar to 1/4 cup since strawberries and blueberries are sweeter than the original ingredients. They are amazing! I’m not sure my son is actually going to get any. ;) Anyway, thought I’d share. Great modifications Maddie :) Glad they were enjoyed! yum! looks so tasty. 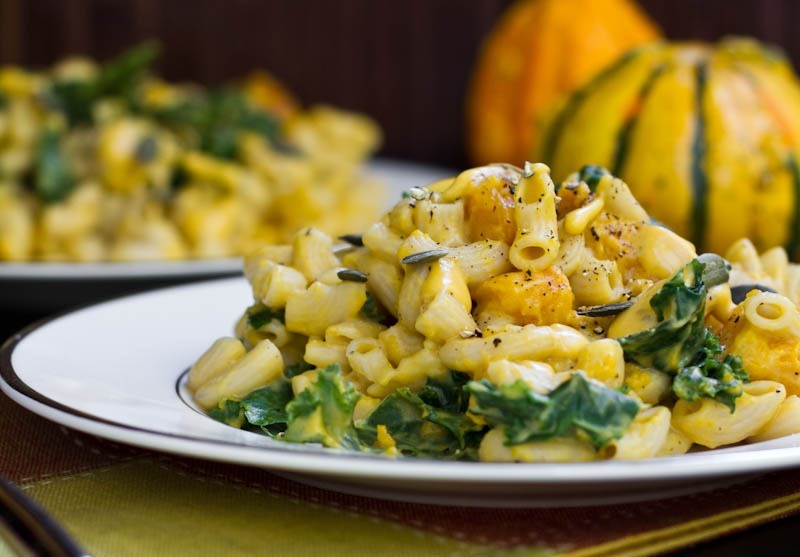 i have never thought of putting squash in with mac & cheeze :) thanks for sharing!! My partner is a huge mac and cheese fan, so I am going to give this a try. I have one question though, do you cook the kale beforehand or just mix it in to the pasta?? I didn’t cook it beforehand, but just mixed it in and heated it for a few minutes. To be honest, kale wasn’t my fav in this. I would prefer spinach, peas, or broccoli probably! Made this for dinner with roasted acorn squash from the CSA and petite peas. Yum! This looks incredible! I am a squash fiend and I LOOOOVE vegan cheese sauces (even better than real cheese in my opinion!!)!!! I need to try this asap!! The whole thing look awesome but the sauce itself looks…drinkable! I would even just like to dip veggies in it, use it as any sort of dip, topping, dressing, coating…it is versatile, big time. feel the same way about cashews and using them in raw/rawish/vegan recipes. They are fantastic but it's also good to make things that are dependent on soaking them or just using nuts. I know you're having GI issues…take a look at nuts. I have all kinds of things I could tell you about nuts and if you wanna chat or hear my 10 year long trial and error stuff concerning them, email me. But back to the recipe..it looks incredible! Hi Angela! I’m so happy you posted this recipe for a low-fat vegan version of mac and cheese. I just posted a butternut squash non-vegan version on my blog last week and it was so yummy, but I’m really excited to try this one out as I’m beginning to dabble more and more with vegan dishes. Thank you! And thank for so many other totally yummy dishes! I have to say, I’m glad you’re straying away from cashew based sauces because that means I can actually eat these recipes. Yay! :D I will definitely be trying this out! This looks wonderful! I have a butternut squash in my fridge that this would be perfect for. Can I offer a finger-saving tip? Squashes are quite happy to be roasted whole. I’ve been eating much more squash since I learned that you can throw them into the oven without cutting them in half first and then seaon them after they are cooked. Really?? Wow, that sounds too good to be true! Can I ask what temp you roast it at? Also do you prick it with a fork to let air escape? I roast my squash at 350 – although my oven is older, so this may not be 100% accurate. I often poke it with a knife after 20 minutes or so (after the skin has softened up) to see how close to “done” it is, and to keep the skin from puffing up too much. Just one poke seems to do the trick. I’ve said it before, I’ll say it again. You are a GENIUS. I have the squash in the oven as we speak! Can’t wait to try this!! I have a mystery squash in my fridge from my CSA box this week–think I may have to attempt this tomorrow with…whatever squash that is. O_O Ok, that tops it, time to try your vegan cheeze. I’ve been on my wagon (My name is WeyrCat and I’m a mac-in-cheese-oholic) for MONTHS, but this… I got an email today from a food website with TEN, TEN different mac and cheese recipes in it, and now this. I GIVE IN! I will have vegan cheeze as soon as I can find the nutritional yeast. It seems like the stars are telling you to make mac n cheeze! I love how you call it “cheeze” heheh. I have been a lurker for a while but I figured I would comment now, since I started my own blog :) Even though I’m not vegan, I enjoy reading, especially now that I’m an RD and get plenty of questions from vegans and vegetarians. Oh I am SO making this! Yum! Angela… WOW… You outdid yourself with this recipe!!!! As soon as I saw this post today, I had mac n cheese on my brain ALL DAY and knew exactly what to make tonight! I’ve had a butternut squash on my counter for the past two weeks, waiting to find something that caught my attention in a good way to use it. This was BY FAR the best mac n cheese recipe I’ve ever had or tasted– vegan or not! I liked it much more than the cashew cheese sauce you’ve shared before (although that was fab too! ), as this really replicates the rich, creamy, smooth texture of a velveeta-like cheesy dish. AMAZING! I was spoon-feeding myself out of the bowl, murmuring with glee. I mixed with snap peas, frozen peas, spinach, and extra roasted squash. DELICIOUS! THANK YOU!! holy vegan! That looks so scrumptious!! this looks totally amazing. once my academic week is over, this is the first food i’m going to make. until then it’s salads from the hospital, which don’t even compare to the salads on your recipage. thanks for making your recipes so manageable for a busy and stressed student! I can’t wait to make this!! The only question is do I add spinach or kale….decisions decisions!! I think I love YOU!!! 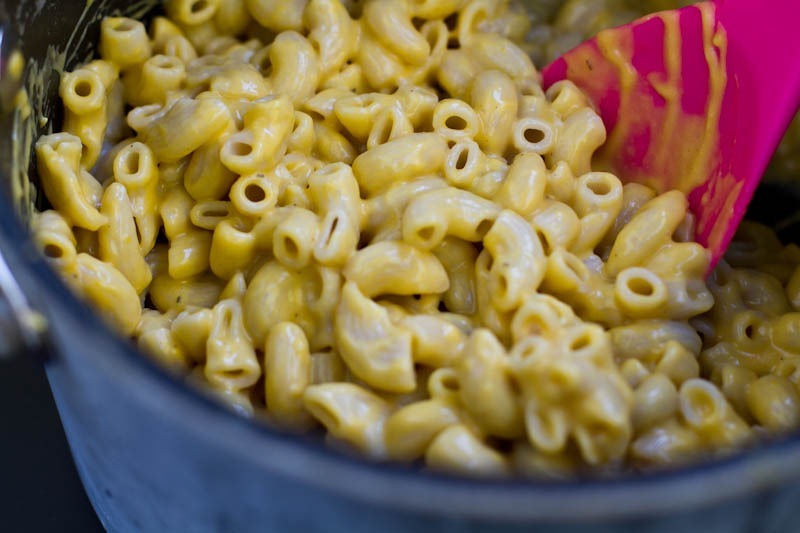 This post has touched my heart….I love MAC ‘N Cheese and real cheese kills me!!!!! I will absolutely be making this!!! This looks AMAZING! I love a girl that adds veggies to mac and cheese! So glad the cheeze came out amazing so you wouldn’t have to eat yucky leftovers by yourself for a week! Wow, this is fantastic! Thank you so SO much for the recipe, I can’t wait to try this! I live in Israel and I can’t find Earth Balance. Should I try making the recipe with out it? hmmm…Can you find any other non-dairy butter replacers? This looks amazing, I’m definitely going to try it. So healthy too! Thankyou for the recipe! THIS LOOKS SO SO GOOD! i can’t wait to make it!! great recipe! I am so excited to make this!!! :D I have a butternut squash in my fridge that I had no idea what to do with–but I am pretty sure it is fate that I read your post!!! YUM! I can’t wait to make this for my family. Each day when I see Oh She Glows pop up in my Inbox, I can’t wait to open the email. and for providing such lovely inspiration every day!! It is very appreciated. Aww thank you Angelique :) I’m thankful for you! This is a lovely idea. Can’t wait to try! Any ideas on how to make a sauce without cashews? I’m allergic to cashews! :( Thank you! No problem! :) It’s easy to miss ingredients. I have all the ingredients at home right now. Hello dinner!! :) Thank you for the great recipe. Oh yum, just the kind of comfort food I’m looking for in this sudden cold snap! And a delicious way to eat up the acorn squash we scored at the farmer’s market! This looks amazing! Even though I am not vegan I find all your recipes very inspiring as I have an allergy to dairy and also wheat. Your avocado pasta sauce went wonderfully with rice noodles :D Thank you for being an wonderful inspiration. Plus your photography is even more stunning with every post. I am an artist in Scotland that specialises in painting food and would love to maybe recreate one of your photos into a painting for you one day! Hey Emily, Thanks for your comment! How wonderful you are an artist, much respect for you! Thanks for the how-to. Very helpful! I love love love this recipe!! I recently made a cheese sauce using yellow split peas and we used it for a vegan mac n cheese…can’t wait to try this combo!!! oh my, I LOOOOVE this recipe!! This looks so yummy!!! The moment I saw it, I thought of substituting pumpkin for squash!! Can’t wait for your pumpkin mac and cheese recipe! I’m already drooling thinking of it!!!! Made this last night for our first knitting circle meeting! Added peas, and called it Mac ‘N Peas! 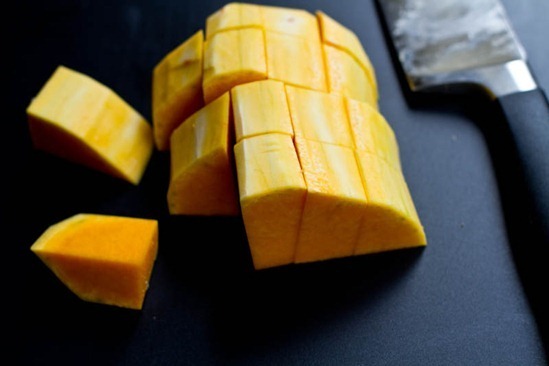 Im not a fan of butternut, but this would be AMAZING with kabocha :) or pumpkin. you can’t taste the butternut, it just gives it that nice kraft mac ‘n cheese orange glow! I would agree that the b’nut taste isn’t very prominent :) I’m sure many squashes would work though! You never fail to amaze me. This looks so yummy!!!! I absolutely lOVE LOVE LOVE this, and yes it satisfies just as much as dairy cheese. dried minced onion and even MORE nutritional yeast. Don’t get me wrong, it was wonderful just the way the recipe was written, but for my tastebuds, I’d add those things. And maybe even a bit of fresh minced garlic. I lined my casserole dish with parchment paper so the noodles wouldn’t stick. I think that was a lifesaver for cleanup. If you’ve ever been afraid to try a “vegan” Mac ‘n Cheeze” you have to try this one. This will be one of my favorite go to meals. I have to be careful not to eat the entire casserole I just made. IT SOOOOOOOOOO GOOD! Mac N Cheeze VeganAnd so, with that endorsement, I decided to give this recipe a try. I actually went out and purchased all the ingredients the day I read her post. Well, here it is fresh out of the oven with my pics. It not only looks gorgeous on the table, is truly delicious. THIS WILL BE ONE OF MY “GO TO MEALS”. I absolutely lOVE LOVE LOVE this, and yes it satisfies just as much as dairy cheese. I opted to add my green vegetables as a salad (or whatever green I have on hand) on the side. Next time, I’ll probably add broccoli to it while it bakes. I wanted to try it “naked” so I could get the full flavor. I also can tolerate wheat so I opted for whole wheat noodles (notice I’ve changed Angela’s recipe to reflect that). Having said that I do want to add that it would be even more scrumptious with some dried minced onion, or even fresh onion (though I wouldn’t want to “water down” any of the sauce) and even MORE nutritional yeast. Don’t get me wrong, it was wonderful just the way the recipe was written, but for my tastebuds, I’d add those things. And maybe even a bit of fresh minced garlic. I haven’t had hubby try it yet, but even “if” he doesn’t love it, I do. Okay the verdict is in from Hubby … he loves it! Yay. I’m sooooo thrilled. I’m even going to make this again this coming Saturday evening. I’m having friends in for my annual Harvest Dinner Party. I’m not telling anyone it’s vegan and will see what they say. Thank you again Angela. Happy Happy Happy Day! oh i really want to eat some of this! It looks so good~And wholesome, not too heavy. Definitely going to try this one out! Yes that’s a good point too. This looks so good! I’ve had a butternut squash sitting on my counter for a few days, and NOW I know what to do with it! Looks divine :) ! Just made this. holy cow. ah-mazing!!!!!!!! giant thumbs up! thanks! Glad you enjoyed it Jenn! Yes unfortunately it is essential as it is what gives it the cheese-like taste. I made this last night, I used wholemeal penne, roasted pumpkin and added some peas at the end. It was delicious, and really easy. Thanks so much for this recipe, I will definitely be making it again! I’m glad it worked with pumpkin! Yum this looks delicious! 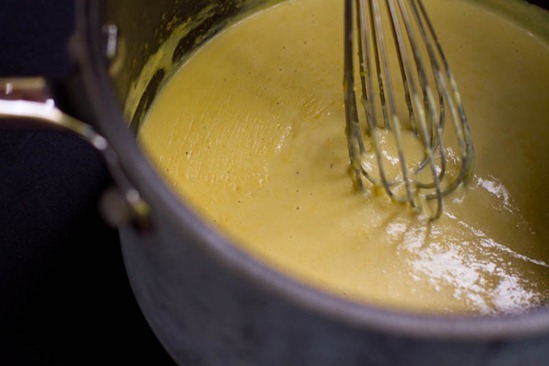 I wish I would’ve had this cheese sauce recipe to put over my homemade butternut squash-chili and sweet potato fries! Hmmm I may have some left over.. Seriously is there anything you can’t make!? This looks absolutely amazing and I loved the idea of adding some leftover squash chunks! This cheese sauce is so so good! I decided to change it up a little by adding liquid smoke (to create a smoky cheezy flavor, like a smoked gouda cheese sauce I used to love before transitioning to veganism.) Turned out great! And perfect timing too because I had a butternut squash sitting in my vegetable crisper and I’d been wondering what to do with it! What a comforting meal to welcome fall (although it’s not too cool here in Florida!). Thanks for the fabulous recipe! I found it at Publix (a really great chain grocery store in Florida and Georgia). I have the Colgin brand, which I think is only sold in the US :( If you can’t find it in a store, you could probably order it from Amazon, or request your local grocer to carry it. Some stores will order items on special request. Hope that helps! Thanks, I will keep looking! You can get it at pretty much any grocery store next to the barbeque sauce. I actually got mine at superstore, and i know you shop there! Thanks! 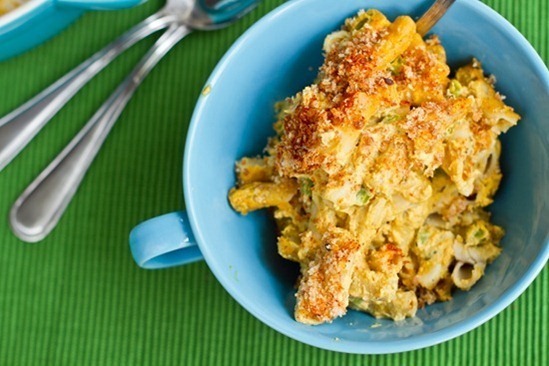 I haven’t had mac and cheese is so long and this takes a healthy spin on it! I can’t wait to try this on my kids! Oh MY GOODNESS! SO SO SO YUMMY! I wanted to eat the whole batch my self but my picky kids wanted some too so I had to share! Loved it so much – def will be making this a lot this fall/winter as a perfect, healthy, yummy comfort food!! THANKS! Hey Larissa, Thank you for your enthusiasm! It’s always great to hear that others enjoy the recipes that I do too. :) Thanks for your feedback! I halfed the recipe and didn’t have any Dijon mustard so just used regular mustard, still turned out great and yummy! this ist looking soooo good! I made this last night for dinner and it was amazing! I am a vegan and my meat loving bf is trying out veganism with me (He said he would give me 15 days! I’ll take it!) We both LOVED it! haha that’s amazing he’s trying veganism for 15 days!! I’m happy you enjoyed it so much. This is pretty similar to the way I make “cheese” sauce at home for my son. He can’t have dairy so I have been using butternut squash for creaminess + color since he was about 4 (when pre-school started and he found out about the cheesy pasta dish). Nutritional yeast is something I started discovered during the past 2 years, and since last year I have been adding to my “cheesy” sauces too. I tried your recipe yesterday and we loved it!!! As I said, quite similar to how I make mine, but more nutritional yeast then I use and I think that made a nice difference. I also loved using dijon mustard as opposed to dry/powdered mustard that I used to add to my sauce, love the flavor better with the dijon. Thanks for sharing another awesome recipe Angela! This was a great hit with all of us here, the husband also liked and better than anything my son loved it, was happy with our dinner and asked for me so save the leftovers and put in the lunchbox for the next day, I could not have asked for a better recipe! Hey Ana, I’m glad to hear it was a success! I made this last night and was SO excited to be prepping, cooking and then eating it. I’ve always wanted to make vegan mac and cheese but I never got around to it and this recipe was perfect place to start. I mixed in kale and put breadcrumbs on at the end and broiled it. Amazing! And my boyfriend loved it too. Thanks! Hey Andrea, I’m so happy you both enjoyed it! i made this yesterday, except i accidentally used brewer’s yeast instead of nutritional yeast. (i’m new at this… still learning!) fortunately, it STILL earned my husband’s stamp of approval and reaffirmed his love for me. ;) (he really REALLY loved it) didn’t pass muster with the kids, but they’ve been programmed with a love of highly processed foods, so it will take a while to turn them around. thanks again for the recipe, it’s definitely getting saved over here! I’m glad you and your husband enjoyed it! I agree kids can be tough taste testers! Man, I really need to find a supplier of Nutritional Yeast that is cheap! I’ve only found it in Whole Foods (aka Whole Paycheck) and it was sold by the OUNCE! Eeek! As a cheese fiend just like you, I need to cut back and this sounds amazing. Two of my favorite loves: cheese and squash! I’m soooooooooooo excited to try this. I feel like Mac and Cheese is the one thing standing in my way from being totally vegan. I’ve tried countless recipes before, and they all tend to be higher in fat than I would like. But this looks amazing. I saw in the post that you made it stove top. But have you tried baking this version of cheeze sauce in the oven? I love a good baked mac n cheese with breadcrumbs on top, just not sure how this sauce bakes up. Just made a double batch of this to freeze so I can have it for a future busy night, and it tastes so amazing! I used a buttercup squash, since that’s what I had on hand, and to cut the fat I roasted it, unpeeled, face down on a cookie sheet lined with parchment paper. Just wait for it to cool enough to handle, and you can scoop the flesh right out! 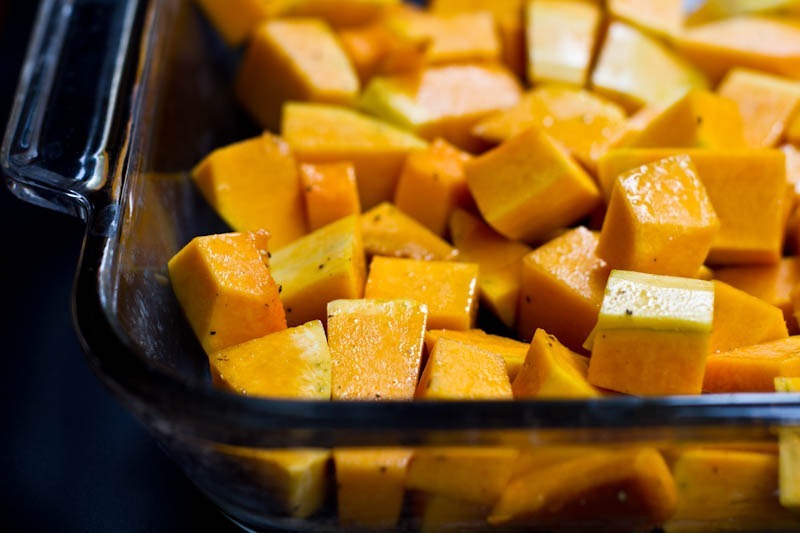 This is a great method for roasting winter squash when you don’t need it to be in perfect cubes for the recipe, and you don’t need any added fat. Thanks for the great recipe, I will definitely be making this again and again! Question on freezing, I don’t normally make extra stuff to freeze but want to try to do more of this so that I can have it in the future. Would I just freeze the sauce in a container and then leave it sitting out the day I want to make some of it? Can I then re-freeze what’s left? These might be silly questions, but wanted to ask! Ps. I used ripple pea protein instead of the almond milk since it’s high in calcium and it tastes delicious with this too! Looks easy and delicious! Thank you! Made this tonight, and it was delicious. Thanks for another great recipe! Made this for dinner tonight. Definitely a winner! i made this last night and added broccoli. i used the shiritaki noodles, which are soy, or something like that, and i wouldn’t recommend using those. it really took away from the flavor of the sauce. tonight i made quinoa pasta and used the sauce, and i love it. i added some herbamare, and i think i found my new favorite “cheesy pasta” dish. thanks for sharing angela! Thanks so much for this recipe. I made it for dinner tonight for my very picky (non-vegan) kids, one of whom doesn’t like squash. They gobbled it up and went back for seconds! So thick and luscious and cheesy … perfect. By the way, I noticed the posts about liquid smoke; I have found it at Loblaws. It’s in the section with the bbq sauces and such. Weird question Angela- do you have any tips for cleaning up Earth Balance? I end up using butter instead because I am so itimidated by the clean-up….it sticks to everything!! I made this last night with kale and it was awesome! The kale added great crunch and texture! Is it weird to say i love you?? haha the one thing i miss most is my mac n cheese, so i have been making the 5 ingredient one you posted (which i love! ), but i am so excited to try this new one!! The amount of earth balance in the 5 ingrdient sauce did cross my mind (but i figured stirring in spinach cancelled that out…), so when i saw this i jumped for joy! thank you! LOL “I figured stirring in spinach cancelled that out” I thought I was the only one who thought that way. Why do you think I start my day off with a green monster….that cancels everything out. wink wink. you. are. amazing. no joke, you have me drooling over my keyboard. oh and FYI this is like the 1000th recipe I’ve pinned of yours, they’re all so delicious looking!! I’ve been searching for years for the best dairy and cashew free mac & “cheese” recipe for my food allergic kids. Tonight I have found it. This was amazing! I didn’t add kale or any mix ins. They gobbled it up and wanted more more more. This is going to be my new standard recipe. Thank you so much for sharing it! Angela … AH-MAZE-ING!!! This is one of the best recipes I’ve made in a while and I could have eaten the whole darn pot it was so good (don’t worry, I didn’t). I used penne pasta because that’s what I had in the pantry and added steamed broccoli. I will definitely be keeping this recipe as a staple. Easy and delicious!!! Thanks a bunch! Thank you Angela, this is the second recipe I’ve tried from your site and, once again, it turned out fantastic. Planning to make your burger recipe this weekend so will let you know how it goes! You can roast butternut squash right in the skin! Cut it in half lengthwise and scoop out the seeds. Place flesh side down on a foil lined baking sheet and pour in 1 cup of water. Bake 425 degrees for 30-45 minutes or until it is easily pierced with a a fork. Remove from oven and remove flesh from the skin with a large spoon. It’s all ready to puree for soups, sauces, and eating! Saves a lot of time! love this tip, thank you! I had been eye-balling this for the past few days and finally had the chance to make it tonight. It was definitely worth the wait! So delicious! Thanks for sharing! this was fantastic. i had extra cheeze sauce (didn’t make quite as much pasta and wanted a little lighter coating) so i put it in a jar, added some green chiles, some onion powder, cilantro and some spice — VOILA! VEGAN QUESO! it was amazing. This is probably the best thing that has happened to me, culinary speaking, since Isa’s maple-dijon green beans and potatoes. Your recipe is the first I have found to actually taste, dare I say, BETTER than actual mac and cheese! I omitted the dijon and added a pinch of nutmeg for a more classic flavor. I was out of almond milk, so I substituted coconut milk, which worked out fine. I tried this tonight with spaghetti squash instead of butternut. It’s sooo good! I overcooked my squash yesterday so instead of strands I got mush. I though I’d try it as a substitution and it worked! I can’t wait to try it with butternut squash soon! I made this the other night with buckwheat instead of pasta and IT WAS AMAZING! I added in kale and sprinkled it with some cayenne. mmmmmmmm. I’ve made about a dozen of your recipes and I absolutely love every single one of them. Namely: carrot apple ginger soup, curried lentil soup, chocolate/carob chips, maple/hemp/chia almond butter and weekend kale glow salad!! I’ve also hopped on the VOO bandwagon and have never been happier with my morning oats. My friends and family keep asking where I learned to be such a great cook so I tell them I know how to read directions and send them to your page ;) thank you for all the inspiring meals!! I made this tonight after I picked up some pre-cut butternut squash pieces at Costco and oh. my. gosh. DELICIOUS! Everything about this recipe was so intriguing I couldn’t wait to try it. Now I can’t wait to share this recipe with friends; I would take this mac ‘n cheeze recipe over the real stuff EVERY time. Thank you, thank you, thank you!!! Just wondering if this re heats well? or is it so good you never have had leftovers? Thanks, would love to have a recipe to take to work with me for lunch. The macaroni + sauce doesn’t reheat that well, so I suggest keeping the sauce separate to reheat and use fresh noodles. It also gets a bit clumpy but you have to give it a good stir when reheating. I just ate this for lunch at work today. I made a serving of pasta this morning and packed it with some leftover squash. I packed the sauce separately, and heated them separately. 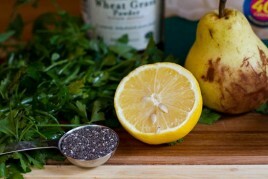 Was great with baby arugula! Also a good tip for reheating cooked noodles it to heat them gently in a pot of hot simmering water (only for 1-2 minutes until they soften) works like a charm! No more throwing out leftover pasta. Made this earlier today and reheated when I got home from work. I poured in extra almond milk before popping it in the microwave, and it came out great! On a side note, I wasn’t sure how I felt about this one when I first made it. The sweetness of the squash kind of turned me off and I was bummed (I’m not a “sweet and savory” kind of person), but it seems like the sweetness dissipates and the flavors really come together as it sits. I am actually a fan of the reheated version! I mixed in spinach and added s+p. Good to know, thanks for your feedback! Delicious! I can’t believe how good this is. My roommate even ate this which is really saying something! She is quite the cheese lover! Thanks for a wonderful recipe! ohhhhhh my goodness. just made this and devoured it in about 2 minutes. i cut the recipe to 1/3 of the original and ate the whole thing….oof. completely worth it though! because i didn’t have any arrowroot or corn starch on hand, i subbed in some coconut flour which gave it a lovely subtle sweetness i didn’t expect. tossed in some chicken sausage, mushrooms, broccoli and baby spinach, too. a perfectly satisfying and comforting fall dinner–thank you! This sounds delicious! I am trying to avoid all processed oils, do you think this recipe would work without the Earth Balance? Would you recommend just omitting it or adding something else in it’s place? You could probably get away with leaving it out. Let me know if you try it! I made this for lunch today and it was really good! I had some butternut squash in the fridge that had been pre-roasted (a super easy way to do this is to just cut it in half length-wise, scoop out the seeds and place in a shallow dish with an inch or so of water in it. Cook at 350*F or so for 45-60 minutes, or until soft. Then, all that’s left to do is scoop the soft flesh out of the skin and discard scraps. SO much easier than cutting and peeling it! And the good news is, I didn’t even need a blender for this recipe. I just scooped out enough of the flesh and whisked it in!). I added a little more garlic powder and some red pepper flakes. It was delicious served over brown rice penne with great northern beans and steamed swiss chard + peas! Next time I think I might try it with less Earth Balance (or else use oil or something). I just made a variation on this (my first ever attempt at a vegan white sauce!) and it actually turned out pretty good! A lot better than all my other new-vegan experiments, and this is definitely going to be something I’ll make again, tweaking to make it better. I didn’t have arrowroot, can’t find nutritional yeast/wouldn’t buy it if I could (trying to avoid yeast at the moment), don’t like mustard… so you can probably guess it was quite different to yours! I used buckwheat flour (I live in Spain at the moment and it’s been very hard to come by gluten-free flours…) which made it decidedly not white but still tasty! I had a bit too much butternut from the one I roasted but just used it all, my sauce was a bit lumpy as all I’ve got is a stick blender. I mixed in some leftover millet, so I made a bit less pasta that I should have done, but it still turned out lovely! Will try to blend the sauce longer next time/roast the butternut longer and use a bit more pasta. I heated it about 15 mins in the oven with sunflower seeds on top – yum. I only read the comments about reheating this after I made it, so we’ll have to see how reheating it goes as I’m just cooking for one sole vegan in an apartment full of meat/cheese heads! …. but thank you for making me finally feel like I’m not a vegan failure in the kitchen! This was the perfect meal for carb-loading! I’m running the Scotiabank half marathon tomorrow and just made your recipe for dinner… added in steamed broccoli & pumpkin seeds. WOW. SO good and very satisfying. This was also my first time cooking with nutritional yeast – tastes great! just made this and it was fantastic! thanks for sharing! I used whole wheat pasta and added kale, peas and chunks of roasted butternut squash. Very tasty and filling, but didn’t leave me feeling stuffed. Delicious and nutritious! This looks absolutely amazing, can’t wait to give it a try! Oh and definitely mix in a green for that added flavour! hehe reunited and it feels so good..that’s cute! Now I have the song in my head :) Glad you liked it! Made this Saturday night with my boyfriend – it was incredible. So incredible that….we made it again Sunday night (no, not leftovers, we made it again, a whole other batch!!) Also, thank you for introducing me to nutritional yeast! I made this for dinner tonight and it passed the husband AND cheese loving 5 year old test! Thanks for the great meal….this ones a keeper! In-flipping-credible! I can’t wait to try the pumpkin version, but tonight was with roasted butternut squash. My add-ins were kale and red kidney beans and oh! Such wonderful comfort food, I have such a happy belly! Thank you! Oh my goodness… I made this tonight and it is more divine than I could have imagined. Definitely a keeper! Love it. THANK YOU!!! Angela, I made this for lunch today and it is one of the most incredible sauces I have ever tasted IN MY LIFE. Thank you so much! I will be making this often! The amount of sauce I ate straight from the blender is CRAZY. OMG!!! Oddly enough not a huge fan of it on pasta, it still tasted great, but the pasta got lost. I feel like I’m going to take this sauce next time and do a rice and broccoli casserole (old school comfort). I need to figure out if this sauce freezes so I can keep it to randomly break out for veggies. You seriously knocked it out of the park with this sauce. made this tonight – so freakin’ delish!! I made the sauce before blending it with the squash (as in your directions) and obviously had to taste it…but could have ate that sauce alone!! great with and without the squash. was wondering if you have ever used the sauce without the squash? This looks so good. I have some already roasted butternut squash in the fridge and have been eyeing this and your Butternut Squash and Black Bean burritos. I was wondering if unsweetened original soymilk would work fine in this? I don’t know much about the differences in milk substitutes and I only have vanilla unsweetened almond milk right now and that would definitely not be the best decision! Im not sure, but I would guess it would work! I just wanted to let you know that I have not had the chance to make this yet…but I told a family friend about it who is all about meat and potatoes for her family of 4 boys and they all LOVED this recipe! That is definitely saying something…wooohoo! I just made this recipe to take for lunches/dinners at work this week and it is divine! Oh, girl! You can roast squash so much easier than that. Next time, try slicing it in half (lengthwise, like you did), rubbing a little olive oil on the opened side, and lying it face-down on a baking sheet. Cook around 400 for 40 minutes to an hour and voila! When you take it out, flip the squash over and scoop it out with a spoon. No need to skin or chop beforehand. It’s much easier! Thanks I have done this before so I will have to use it for this recipe next time I make it! I made this again today to serve over steamed cauliflower and it was really yummy! I omitted the Earth Balance this time and it still tastes great. In fact, I can’t even taste the difference. thanks so much for figuring out how to make vegan mac and cheese! i just made this sense i got a beautiful squash from the farmer’s market this morning and it was an incredible lunch treat. i appreciate you sharing your talent and creativity in the kitchen! will definitely be making this again. do you know how long it will last me in the refrigerator? Just made this tonight… Delicious! I used canned pumpkin, and added a bit of nutmeg. this was AWESOME! I forgot that I had to use the stove, I just threw everything in the blender and it tasted phenomenal. I even used a bit less butter :). It was freaking AWESOME! Thanks Angela! I made this tonight with canned pumpkin because I had it on hand. I also threw everything in a baking dish and topped it with some breadcrumbs and baked it. It was sooo good! Thanks for the recipe! Mmm! I saw this recipe and I knew I had to try it! I made it for Thanksgiving and is was delicious. The only downside was that I stored it in a glass dish with a glass top and it dried out a little over night but it was still awesome. this recipe is off the chain!! i’m eating it now and couldn’t even wait until i finished to say thank you! so tasty, so healthy, and because i had leftover roasted pumpkin in the fridge, came together in about 10 mins! gahhhh amazing! I LOVE this recipe. It will definitely rotate into my regular meals. I shared this with several friends who all loved it! Made this for the carnivore boyfriend last night and he loved it!! This recipe is amazing, better than any regular mac n cheese recipe I’ve ever had. Thanks!! I make this again and again, either with roasted squash or canned pumpkin. It’s excellent every time! Very good on broccoli. So easy and delicious. Thank you! This was amazing! I wasn’t too sure how it would turn out, because I tried the sauce on it’s own and it was a little strange. I put this in a casserole dish, topped with panko, and broiled for 10 mins. Less creamy, but soooo delicious! thanks! Made this last night for dinner. Super delicious! Found this on Pinterest and made it tonight…delicious! I added toasted whole wheat bread crumbs and peas with a side of broccoli rabe mmm thanks so much! This looks great!! I was going to ask how you thought it would be with brown rice pasta, since that’s been my thing lately, but I see that is what you use too :) Can’t wait to try! Just made this for a potluck dinner tonight….I’ve loved all of your recipes so far but this was unreal good. I’m cutting out all oils for a month so I left out the Earth Balance and it was so so so good. Great work! Yum! Just made this today. It is soooo good. This will be on holiday menus! Thank you, thank you!!! this looks yummy but wanted to caution you about the use of nutritional yeast. (and all deactivated yeast: autolyzed yeast, tortula yeast, yeast extracts, etc.) the heating process that deactivates the yeast produces glutamic acid, a close cousin of monosodium glutamate. it is a neurotoxin and will make sensitive people extremely sick. i would get migraine symptoms from even trace amounts of this ingrediant. this comment is the equivalent of seeing a stranger drinking a Coke Zero in the at the bus stop and berating them that the aspartame will kill them. Clearly the people with this intolerance would stay away from this recipe…don’t be such a Debbie-Downer. I’m sick and tired of the fear-mongering around food nowadays. Maybe we should all stick to tap water? Recipe looks FAB, btw and I’m not even vegan! This looks amazing!! I don’t use earth balance, have you every tried this with an equal amount of coconut oil?? Anyways, here’s an opinion of a true dairy-loving mama, I hope me sharing my opinion doesn’t offend anyone. Not at all, thanks for sharing! I hope to re vamp the recipe soon. Others have mentioned in the comments that they doctored up the sauce a bit, maybe that would help? Something new to this comment: I figured out that the German store-bought nutritional yeast seems to be stronger in flavor as the one you use in Canada. By trial-and-error I got to the result that it tastes great if I use about one third of the amount that you use. So, in this case 2 instead of 6 tablespoons. LOVE your recipes! Can’t wait to make this tonight! I just found this recipe and made it tonight (baked it with GF breadcrumbs and spinach). Wow, is this good! I would never have thought to add squash to a vegan sauce, but it’s yummy! I also like how you get in a vegetable with it, and how it makes the sauce nice and smooth. Thanks Angela! Just made this for dinner tonight- HEAVENLY!!!! Thanks for a great recipe! I just made this for me and my very picky 2 year old daughter and it was a HUGE hit!!! It was so delicious and creamy! So easy! We live in an area that gets flooded with fall/winter squash, so this is a great use for them! I will definitely be making this again. Thanks for the great recipe! Trying this soon!! Do you think it’ll still taste the same if I don’t add nutritional yeast? Don’t know where to buy that stuff! The nutritional yeast gives it a cheese like flavour a bit, so I dont suggest leaving it out. Goodluck! I just made this today and it came out amazingly creamy and flavorful! I love the hidden squash for extra nutrition. I ended up doubling the recipe to be able to use a full 16 oz bag of corn penne pasta. There is plenty of sauce – I hope my hubby loves it, as he loves cheese. I mixed in some steamed arugula and butternut squash cubes. I ended up a little short on nutritional yeast, but the sauce still turned out nice. I may sprinkle a little Diaya mozzarella shreds on top for presentation and a cheese boost. I went to get some more nutritional yeast at the local (small) health food store in my town. They showed me where it was and I ended up buying it, but it turned out to be brown granules – brewer’s yeast. It had a slight cheesy taste, but definitely more nutty/sweet and not what I’m used to for nutritional yeast. I ended up not using it in the sauce in case it messed up the end mac and cheese flavor. Do you have any suggestions on what I can do with the brewer’s yeast now that I’m stuck with it? Hey Krista, Glad to hear it turned out nicely for you still! I havent used brewers yeast before Im afraid, but I would try googling for recipes. Goodluck! Yummy! I have been trying to figure out how to do a creamy vegan fondue, and this works! Try dipping roasted potatoes, cauliflower and baby reds in it. Even my 3 yr old can’t get enough, and she hates cooked vegetables! Yum! I doubled this for dinner tonight. So delicious! I added mushrooms and cooked yellow split peas for (well-disguised) protein and nutrients. I cannot wait to make the Rolo recipe… first I have to stop eating the chocolate chips. Would this taste ok using acorn squash? I made this sauce not because I was vegan, but because I am highly sensitive to any dairy products and needed a cheese-less staple for pasta. I followed the directions exactally except for adding 1/4 tsp onion powder, and wow…was this recipe thick. I did enjoy the cheese like flavor, however for a “new vegan” to try this recipe I would use 1 to 2 tablespoons less nutritional yeast and increase the almond milk to 1 cup instead of 3/4. Was good for a different kind of sauce! Made this a couple of nights ago, and it was an instant hit. I blanched a bunch of kale leaves before adding it to the food processor and mixing it with the sauce. Delicious. Will make this again! Eating this right now and it’s seriously so good. Go. Make it right now. Hi! I made this and it was very delicious! I should have added a tad more nutritional yeast but it was still delicious. My mom has recently had her gallbladder (today actually) and has to be on a low fat diet so I was wondering if this would be considered low fat? ( I’m not good at figuring that stuff out lol). I was also wondering what other dishes of yours you would suggest that my non-vegan mother would like that are low in fat that I could make for the two of us. This is my first recipe of yours I have made and I can’t wait to make more! I will try this out on the hubs this Sunday. He’s picky, but I’m hoping this is a winner! Made this last night and **accidentally** added the whole can of pumpkin and therefore had to make double the recipe…and boy was it a mistake i’m glad i made. THIS WAS DELICIOUS! My husband loved it too! I sooo love your recipes! Excited to try this for Thanksgiving. Cooking it today. Hope it’s even better the next day. Thank you. I ate the mac’n’cheese first but suspect I’m not (North) American enough. In any form that much pasta just isn’t a good idea! However, the sauce is absolutely delicious, if crying for an intensely savoury match. So I made a cauliflower pizza crust with nutritional yeast and flax egg instead of the usual dairy options, topped with an oregano rich tomato sauce and then the squash cheeziness. After a few minutes under the grill drizzled with a little oil I ate one of the best pizzas of my life. And have been smugly forcing it on my friends since. Virtuous, nutritious and delicious. Thanks a million! I tried this butternut squash recipe out a little bit ago and it turned out fairly sweet. I followed the steps as they were shown. I tried to cheese it up a bit more by adding some more nutritional yeast to the final blended concoction, while it helped, I could still tell it was very sweet. I also added a little more lemon juice, garlic, onion and it helped a little but was still noticably sweet, I added some habanero hot sauce *dave’s hurtin’ habanero* that helped out quite well, it made the cheese sauce taste more like nacho cheese sauce but there was still a hint of sweetness left on the palate. Do you have any suggestions for next time? Have you experienced any sweetness or do you think it could just be my palate? I am pretty good at dissecting flavors as well as crafted beers and bourbons, so I don’t know if my complex palate has anything to do with it or not. Do you cook the kale first?? No you dont have to unless you want to quickly saute it Totally up to you! Spinach would also work well and of course it’s a lot softer. I’m making this right now and just finished the first part of the suace (sans squash). I’ve never used nutritional yeast before… and I’m not sure how to ask this. Doest it have a bit of a unique after taste? Or is it possible that the store that sold it to me needs to replace it more often? Hey Jody, Yes nutritional yeast does have a strange taste. It took me a while to get used to it! I made this. It blew my mind! thank-you! Wow! This tastes amazing. I made it with a can of coconut milk. Very creamy. It’s a keeper. thank you so much for sharing this. it’s wonderful. i didn’t have almond milk so i used water and added an extra tablespoon of earth balance. also, i didn’t have dijon mustard so i decided to just omit it. then i thought to add turmeric for its health benefits, and realized as i was adding and smelling it, turmeric has a slight mustardiness to it!=) also added green beans. it was delicious and hubs thought so too. thanks again! This is absolutely lick-your-bowl clean delicious! For the extra squash, I just threw it in the pot whole as a mix-in. Yum!!! Thank you for an awesome recipe! I just made this sauce and dumped it all over steamed cauliflower instead of pasta, and it is divine! It covered 6 cups of cauliflower, but it could have easily covered 8. “…but with trial and error I’ve made recipes that not only satisfy my cravings, but make me crave the new recipes instead of actually craving cheese itself. I’ve heard people say that cashews make an awesome vegan sour cream as well. And now this for mac cheese sauce looks great too. Excellent. Thanks for posting, looking forward to trying this one. THANK YOU for sharing this healthy, delicious (not to mention beautiful) sauce recipe. This is so over-the-top delicious! I really love the salty-sweet taste — the squash and yeast go well together. My very picky son ate all his pasta and sauce up without a moment’s hesitation. I’ve had this bookmarked for ages and finally got around to making it yesterday, though I kind of blended it with another recipe I’d found somewhere else, which instead of using squash purée, uses butternut squash soup in the sauce. I hadn’t planned to buy an actual squash to roast, so I bought the soup instead and used 2 cups of it in place of the almond milk and the purée – spectacular! I did wind up roasting some squash to put in, but I just used the chunks as a stir-in (and used broccoli rather than kale). In any case, just wanted to say this recipe is a keeper! YUM-O! Made for super tonight I am a Huge fan! Thanks! I only just found this and your pumpkin recipe. They both look delicious … and so easy! I have been learning to go vegan, due to allergies, and have just switched to GF. I can hardly wait to try this. One question, and I apologize if it’s already been addressed elsewhere, but is there a reason you don’t simply roast the 2 halves of the squash intact, then scoop out the cooked flesh? It seems like a lot less work to me. Again, thank you so very much for being willing to both experiment and to share with those of us on this journey. You could definitely do it that way too :) I just love how the pieces get more caramelized when roasted in cubes. This is an awesome recipe. I had to use a food processor because my blender couldn’t handle to sauce thickness. I double the recipe. It was just as good as leftovers which is tough with any “cheese or cheeze” sauce. Thank you. I really enjoyed this recipe and I blogged about it today! I adjusted it a little because I like a creamier sauce, check it out http://bedstuyfoodie.blogspot.com/. Love your blog! I made this tonight. It was good, but I definitely needed to doctor it up a bit because I found it to be slightly bland. Next time I’ll put in a little more Dijon, red pepper flakes and a little cayenne to offset the sweetness (and I like it spicy), and onion powder. I’ll probably try a little smoked paprika, too. The only thing I didn’t add was the lemon, because I didn’t see it anywhere in the directions but I did notice it in the ingredients list (oops). I just sprinkled some on after serving haha. I also roasted my butternut squash with two cloves of sliced garlic which I threw in when blending the sauce, but I still added the recommended dosage of garlic powder. Even so it still wasn’t that garlicky, probably due to the fresh garlic being roasted and I love garlic so much that I need a lot to notice it. :) I also added broccoli to mine and it was great. Thanks for the recipe! I have been juicing for the last 22 days and am down 30 pounds in 20 days! Why is this a factor, because my sweet wife, not a vegan, not a vegetarian has been watching me shed pounds like crazy but she can’t bring herself to “juice” like I have been doing it. She told me that she wants healthy, TASTY and FLAVORFUL food! When I saw the term “in the vault” below the recipe and the way that you used it, it floored me! I was like, FINALLY! I have a chance. Both my wife and I gained weight after the kids were born. I gained a lot… 84 pounds since she met me. I started a blog to document my weight loss journey. I plan on losing the 84 pounds in 84 days and then to eat healthy. Maybe 70 or 80/10/10. I’m still looking into everything. However, coming across your website is such a HUGE benefit! I’m loving the finds and loving that you try these yourself and then change them and try them again until they are worthy to go “in the vault” as you said. I plan on looking into all your vault recipes and sharing those with my wife. I followed you on twitter and look forward to finding delicious recipes for my wife and myself. As I will not be juicing forever. Thanks again! This recipe looks AMAZING and I plan on and hope to find even more equally amazing recipes on your site! Thank you! Our FOOD and MEAL time might just be saved! But I’m reasonably new to your site, so I’ve not posted before. I want to say how you have motivated, and moved me with your artistic talents, and how you have given us, your audience your beautiful, and compassionate recipes. Your recipes are just so elegant, and your photography also. If I can be half as good as you, and your wonderful recipes, I would be very happy…. Aw thank you! You don’t know how much that means to me. I really mean what I say, you are my motivation, and I thank you for that. I will be making this over the next few days, and I will let you know how I go. trying this tonight :) recently vegetarian and striving for vegan :) did i miss the lemon somewhere?? thanks, just added it into the directions! I made this recipe tonight and it was interesting. To be fair, I am not a vegetarian and have never cooked with nutritional yeast, so it’s not a flavor I am familiar with. Also, since I did not have a butternut on hand, I used a kabocha squash, which gave it more sweetness than it probably should have had. That said, my 5 yr. old and 7 yr. old ate most of it up, even though they said it tasted weird (obviously, not too weird though!). The texture and color of the “cheese” sauce wasvery smooth, thick and creamy just like that of squeeze sauces from the box. I used trottole pasta which is a very fun pasta and captures lots of sauce. I also added some red kale, which I blanched first. After months of trying different mac and “cheeze” recipes and subsequent protests from my kids, this just got a thumbs-up. THANK YOU THANK YOU THANK YOU!!! I tried this and it was delicious. I made it pretty much like the recipe called for, I happened to have everything on hand. I added frozen organic broccoli, cauliflower and a couple shakes of hot sauce. I would have tried some Jalepenos if I would have had any on hand. I think the Nutritional yeast does taste a lot like cheese. I like it on popcorn too! Most of the comments I read we’re people,like me,that thought this sounded great. I made it with pumpkin instead of squash and no other substitutions…sorry, but it tasted nothing like the Mac and Cheese in my pre-vegan life. The search continues…this one won’t go in my vault. I made this last night and it was very bland. Any suggestions for spicing it up and giving it some flavor? Holy WOW! This is delish! I made it exactly as the recipe directs, and stirred in fresh spinach and extra roasted squash. I put it into an 8×12 pan, sprinkled w Panko, and baked at 350 for 20 mins to toast the crumbs and brown it a bit. I LOVE IT!!!! It’s nice to have a ‘cheese’ recipe that doesn’t call for the pricey raw cashews! THANK YOU for this recipe! Made this for dinner last night. My family liked it a lot. Used real onions and garlic over the powder. I just wanted to drop you a big huge THANK YOU! for this recipe. My body is not a fan of dairy at all, so I had been looking for a quick and easy mac and “cheese” recipe. I’ve now made this recipe 3 or 4 times, possibly once a week since the first time I made it. The boyfriend is a big fan, and it’s so quick I can make it on a week day, after both working all day and doing a workout session, without any stress (I use canned butternut squash to up the easy factor). And to top it off, it’s full of veggies! We’ve made it both with spinach and broccoli now, I love it both ways. Just made this with a sweet potato instead of squash…absolutely delicious! how about oat milk or soy milk? So so so so soooo delicious! THANK YOU! Looks interesting, will have to try it, only problem I see is you do not cook with EVOO, EVOO is used for salads, dressings and low heat, it breaks down very easily when heated and has a very low smoke point. Oil pushed to or near its smoke point is very unhealthy and loaded with free radicals, for cooking use Canola or Peanut oil, both just as healthy as olive and cost a heck of a lot less. Made this for dinner tonight and it was amazing! I had to comment because usually when a recipe calls for that much nutritional yeast it tends to dominate the flavor. Not in this recipe! Oh She Glows in one of my favorite places for recipes! Thanks! Absolutely delicious! This was my first time cooking with nutritional yeast and I was a little hesitant but it turned out amazing! I added regular mustard and fresh onion/garlic and probably blended too much butternut squash ( is there such a thing) but ended up with a delicious thick sauce. Also, I used spaghetti squash instead of pasta! Thanks for this great recipe! Hi Kara, I haven’t tried it, but I can’t see why not! Just make sure to use unsweetened and unflavoured. I wasn’t a huge fan of the sauce (it tasted a little too fake cheesy for my liking), but I like that you were trying to add squash and greens to mac and cheese. I like many of your other recipes, so I was a little disappointed. Otherwise, I really love your website. We made this tonight and loved it! So cheezy and yummy… will definitely make again. I’m so glad I found this blog, I now made a meal plan for the next week and I can’t wait to try all these different recipes. We are trying to incorporate more vegan meals and now that I can make “creamy” sauces I think there will be more and more of those. Thank you! My sister made this recipe when I visited (except we used real cheese… couldn’t help it!) a couple weeks ago, and it was delicious! Yum!! I’m finally cooking this with some pumpkin I just pulled out of my freezer. WOW!!! The sauce is so delicious, I’m having a hard time waiting for the pasta to finish. Nice work! I’m ashamed how long it took me to realize that S&P was salt and pepper… 10 min of google searching later.. I was so convinced it was a weird vegan add in! OMG! This was amazing. Didn’t have a couple of the ingredients but I always know with your recipes that I can improvise and it will still be amazing. Didn’t have almond milk. Soaked 1/4 cup of walnuts for 1/2 hr. Then added to 1 cup of water. Strained and then added about 1/2 cup of the frothy walnut milk. Didn’t use nutritional yeast. Added a few shakes of turmeric for color. Didn’t have Dijon so sauteed 1/2 small onion and 1 garlic clove and added to blender. My daughter wanted some peas added. I thought it was so yummy!! Thanks again for your inspirational recipes! Is it possible to just add in some cashews to this delicious Recipe?? THE best everrrrr! Oh my word, so good. I made it for my friends kids for lunch today too, and they liked it! I have made this recipe 3 times now and it’s lovely comfort food! This time I put more mustard and more squash in and it was just a little different but still amazing. Just made this and I am overwhelmed at how good it was! My 3 year old tore it up! You’re the best! Well well well, I am literally sitting down to this Butternut Squash Mac n Cheese, it is like a little pieace of heaven in my mouth. Thank you thank you thank you. There will never be a need for a mac n cheese with cheese again. I just wanted to let you know that my family and I LOVE this recipe. I have actually made it several times (it is on the dinner menu for tonight). My middle child calls the butternut squash “the guy” (I think she got that from Veggie Tales) so whenever I make mac n cheese she always asks if “the guy” is in it. It is a longer process to use “the guy” in his whole form so I might try the “canned guy” next time. I didn’t even realize that I could buy canned butternut squash. Thank you for sharing your great recipes! Help! Making this tonight – can I use all purpose flour instead of arrowroot and cornstarch? Thank you!! Great recipe. I love this basic sauce and use it for a couple different things (mix in some fresh pico de gallo for an awesome queso dip!). My mother, who loves all things meat & cheese, fell in love with the recipe. That is saying something! Thank you for creating this wonderful meal that convinced me that food can be fun, healthy, and an adventure again! This Butternut Mac N Cheese is as friendly to my tummy as to my palate, and was actually fun to make. I was worried that these ingredients wouldn’t turn out well, but they really did! My kids like this! I can’t wait to try even more of your ideas! Made it ahead of time. Serving it tomorrow. Tonight, we are trying your black bean and butternut squash burritos. I copied your recipe and loved it. I’m going to use the leftover “cheese” tonight to smother some roasted red potatoes. Thank you! YUM! After making the sauce I tossed it in a pan with the pasta, peas and chunks of Field Roast Apple Sage Sausage, then I poured it into the baking pan from roasting the squash and topped it with bread crumbs and baked until it was warm through and had a nice crispy top. Absolutely wonderful, and something different I haven’t had in awhile. Thanks for this recipe! This was delicious! I followed the recipe and added spinach. I may have added too much squash to sauce because it was pretty thick. Still good but I will adjust next time. I also added some of the roasted squash when serving. This will grace my table again! Made this with carnival squash (from our weekly organic veggie basket) and it was delicious. This may be my favorite mac and cheeze recipe to date. Cashew based-one really feel to heavy to me, others are too oily and the ones that call for faux cheese are frankly too cheesy for my taste! This sauce is just the right amount of rich and creamy without being too heavy. And of course I added kale as my add-on veggie :) Thanks for the great recipe Angela! I made it this morning. Felt there was a little too much yeast flavor. Should I add less yeast or add more of another ingredient? I love the consistency. I have to give this recipe 5 stars. It was easy, the ingredient list wasn’t long or complicated, and it was FAST, I cannot wait hours while food is cooking. OH! How could I forget, it was DELICIOUS! Warm, comforting, creamy, blissful….ah…..I’m definitely going to use this recipe again and again. I couldnt find nutritional yeast. 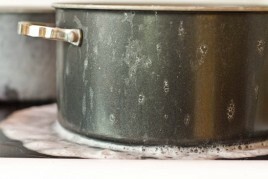 Would it be a terrible idea to use regular yeast? Yes! haha. Nutritional yeast is a “dead” form of yeast and it’s not to be interchanged with regular baking yeast (which is active). Hope this helps! This sauce is OUT OF THIS WORLD. The best of all the vegan mac and cheese sauces I’ve tried. I was worried the butternut squash would lend a sweetness to the sauce that I’d have to overcompensate for with salt, but no, the sweetness actually rounds out the flavor perfectly. Without the sweetness, it wouldn’t have that sharp cheddar-y tang. I added a little more nutritional yeast and didn’t add any lemon juice, and added a touch more water and milk to make it more silky. I may add a splash of lemon juice or white wine vinegar when I eat this with pasta, but I just tasted it and it’s perfect as is. Bravo on a job well done. This will be my go-to mac recipe! 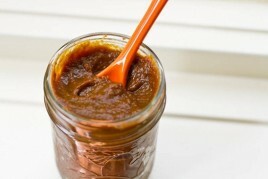 PS– When I made the sauce I tried to store it in a jar that was slightly too small. Some oozed over. I freaked out and frantically licked the side of the mason jar. It’s THAT good. Fabulous!!!!!! Better than cheese!!!!!! I won’t use fake cheese again. OOOOOOOMMMMMMMGGGGGGGG I finally made this yesterday and if I could hug you I would! This is THE BEST EVA!!!! EVA I SAY!!!! Thank you so much for your wonderful recipes. I just made this recipe tonight. In the ingredients list it mentions lemon juice, but in the instructions, it is not mentioned. Just wondering where that belongs. It was delicious and we made it with gluten-free pasta. Just wondering what else you can use instead of pasta, anything? Thanks! Hi June, The lemon is referred to in step 2 – hope this helps! And one more question, please! When you add the kale, should it be cooked first, or just add it raw? And if you’re heating it up again in the oven, is it OK to heat up raw kale, or will that ruin it? Hey June, I just toss it in raw and after it wilts I remove it from the heat. Hope this helps! As for reheating, I just do a gentle reheat in a pot with a splash of water if its dry. Just made this as part of our Thanksgiving feast…so delicious! Thank you! Made this tonight, I was worried at first because I don’t cook Vegan but I needed a milk free idea to take to a party. So I went to the store to get all the goodies (I used quinoa milk because it was on special and I can never follow a recipe word for word, I have to mix it up) My butternut came from my garden this summer and made the sauce the same color as the box of Kraft! I really enjoyed the mac and cheeze! I will be adding roasted broccoli to the recipe from now on because I think I will like it even more that way. I’m also thinking crispy kale crumbles on top in place of bread crumbs! I have made this for the second time tonight (by request from my cheese-loving husband) and we absolutely love it! I added about 1 Tablespoon of fresh thyme, Bragg’s Sprinkle, and peas and it came out great! Thanks for the awesome butternut squash based recipe! It’s a great alternative to the nut-based cheeze sauces. Hi Angela, my husband and I just finished eating this for lunch… added peas. Was tasty. We thought the roasted butternut squash, baked your way, was so yummy right out of the oven but opted to put it in this recipe instead of eating on its own. Turned out to be a good choice. Thanks for another winning recipe! You are so fun to follow! Made this last week for dinner. I was also a huge cheese lover when I used to eat dairy and as a new vegan, this was my first attempt to have something “cheesy” that wasn’t pre-packaged soy cheese. I used the canned pumpkin because I was crunched for time (thank you for that) and used frozen organic peas as the veg. I would probably make it slightly runnier next time but that’s just because I like it that way. But my husband and our dinner guest loved it – I was delighted with the taste, texture, look, plus it also went great with HP sauce, something I always had to have with Mac and Cheese. Thank for you creating this wonderful recipe, Angela, and for giving me something to relive my love of cheese through! Wondering if you, or anyone else out there, has tried this recipe baked in the oven? I think it’ll be just fine, but there’s no harm in checking in with folks. I went ahead and baked it – with gluten free sour dough breadcrumbs on top! i made a double batch of sauce and added more post baking. It was delicious! This my family’s favorite Mac and cheeze pasta recipe. I prefer a non- cashew based one as they can be quite rich. The squash adds a creaminess and sweetness that we love. Thanks for this!! It came out beautifully and was much easier than I first expected. I ended up steaming cauliflower to go with it and the sauce was lovely on that as well!!! I love not always using cashews to create the creaminess! We grew up on Kraft Mac & Cheese. Gross. This was soooo good and so much less guilt inducing! :) I left out the Dijon Mustard cause we never have that around in our house. I love the flavor of this sauce. Thank you, thank you, thank you! I’ve been searching for the perfect mac and cheeze recipe and this is it! Great recipe. I enjoy both this one and the pumpkin variation. I just wanted to let you know that I just made this with my very favourite squash, butterCUP squash, and it’s divine. Try it out! I made a double batch of this sauce tonight (with canned pumpkin)! Yum! I froze half of the sauce, and have high hopes for thawing it out for later use. (I have a Vitamix and am not afraid to blend it smooth if needed after thawing.) Thanks for all of your fabulous, nutritious recipes! I loved this recipe! Only thing is that my butternut cheeze sauce didn’t look as smooth as yours and was quite thick (I also used my vitamix to blend it) other than that, it was really tasty. I love any vegan recipe that’s “cheezy”! I just made this last night when we were hosting dinner with my in-laws…we are vegetarian and they have a son who is allergic to milk, eggs, and wheat. I wanted to serve something that everyone could eat! The mac-n-cheeze was a HUGE hit!! Thanks!! This recipe is absolutely incredible. I have been a vegetarian for 25 years, this year my husband and I made the decision to become vegans. The hardest change for me was giving up cheese-I especially love strong Scottish cheddar cheeses and strong white stilton cheeses. I have tried a variety of vegan cheese to no avail. I came across this website by accident (and even purchased the cook book), I am delighted with this recipe, and it definitely hits the spot for a former cheese lover like myself. Keep up the excellent work. I have made several recipes from the website and book and so far have never been disappointed with any of them, thank you for promoting a healthy plant based diet for everyone, my husband loves you’re recipes-prior to meeting me he was a total meat eater and very fussy about vegetables-he is 100% vegan now-who would ever have guessed the possibility of this ever happening. So I love the idea of this recipe! And overall I liked it a lot and so did my husband. We used brown rice elbow macaroni and that part was just fine. The cheese sauce was great, but when I added the roasted squash… it was a good consistency and looked great but it took away from the cheese taste and made it kind of sweet/bland. I doubled the recipe but I think if I make it again, I will add only 1 cup of butternut squash instead of 2 for the double recipe. I do think it would be a great way to sneak veggies into a picky child’s diet! Thank you for your blog–I love your recipes! This is my all time favorite recipe of yours! It tastes better every time that I make it. Making this tonight, with the first inexpensive butternut squash I saw at the Farmer’s Market! And I’m super ecstatic to try it too, because I entered the recipe onto My Fitness Pal and it’s barely 400 calories per serving! :D Excellent! I’ll eat all four servings. Oh WOW! What a fantastic recipe! Shared it with all my vegan buddies. Since we are an “adult” household, I renamed the dish “Whole Wheat Penne Alfreado” and added a healthy slosh of white wine at the end, along with chic peas for protein, and chopped kale for whatever ails you! Thank you for this wonderful recipe! Wow, this was amazing. Added a dash of smoked paprika and it was perfection. My very skepitcal “cheez” eating husband LOVED it and let’s just say our recipe made 2 portions instead of 4… This WILL be made again this butternut squash season! I put this on some roasted cauliflower and red onions and tossed in some baby kale/chard spinach at the end to wilt. Yum! Seems like a versatile recipe too- I might like to try it with some roasted red pepper, red pepper flake or paprika as you suggested… so many possibilities :0! I realized I forgot the onion powder after I started describing the ingredients to my anti-vegan wife and it still tasted fantastic. She even liked it. I added back some of the butternut squash as suggested as well as some TVP faux ground beef and spinach. I can’t wait to make it again the “right” way with all the ingredients. I have lots of friends and family who have taken gluten out of there diets and a few looking into taking dairy (esp cheese, which is our biggest dairy weakness) but I can’t seem to ‘share’ it on facebook. I see that I can ‘pin’ it but I really don’t use pintrest very much because it’s so hard to actually find ‘recipes’, there’s lots of pins that say they have a recipe but after clicking on it the recipe is no-where to be found, which is very frustrating. Is there anyway you can make it available for me to ‘share’ it to my wall so that I can spread the recipe, and your link, to others? I would greatly appreciate it!!! Thanks for thinking of sharing! There is “Share on Facebbook” link at the bottom of the post. The other option is copy the URL and paste it directly on facebook. Oh my goodness…this is everything I love all into one heavenly comforting dish. Yummm. This recipe is awesome! not only did I make mac & cheese with this yummy cheesy sauce, but nachos as well! They were so good. Thank you for sharing the recipe! I am lactose intolerant and was happy to find this recipe. I sautéed onion and garlic and added a cup of canned pumpkin, chopped spinach and parsley. Finally, I added chili powder. This dish is delicious! I recently passed the six month mark of being a vegan, and this is the first vegan dish I’ve made that actually tasted good! Thanks so much for posting this! I have been struggling with overeating and wanted to find food that was satisfying in small portions. I made this butternut mac and ate a cup and a half and enjoyed every bite. The best thing is, I felt comfortable with the smaller portion size because of the flavor in every bite. Thank you for sharing your creativity. I am going to start making your recipes weekly! This recipe has become a staple for me. I’ve tried it with both the butternut and pumpkin and usually choose pumpkin because it’s easier/faster to just open the can. I’m not vegan (mostly eat paleo) so I’ve used it as the base sauce along with small amounts of real cheese to make a low fat/low carb version of our favorite TG recipe, “Crabby Mac n Cheese.” I substitute ziti shiritaki noodles (0 cal/0 fat/0 carbs/hi fiber) for regular pasta. Not quite the real thing but close enough for my tastebuds to accept. I will be using your concept with cauliflower as an experiment for creamy Alfredo sauces, etc. Thank you so much for sharing and providing healthier alternatives! Made it and then started chowing down on it straight from the pan… had to stop myself to leave enough for dinner! Delicious and I think the kale is a great option; I threw in some spinach too. It seems a bit sweeter than standard mac ‘n’ cheese I guess on account of the squash. My wife (who has tried but rescinded veganism for her love of real cheese) also loved it (which is high praise given my culinary ineptitude)! I eyeballed the measurements and used regular flour (it was all I had) and played around with some seasonings. I really enjoyed the stovetop sauce without the squash! I think the squash added a sweetness that I didn’t care for as I’m not a huge squash fan anyway. Thank you for the inspiration. Cashew cheese is delicious but yes it’s heavy! Just tried making this, it is delicious! I’m not vegan but this is amazing! I was wondering if this cheeze sauce would freeze well? Just made this and it was delicious! Thank you so much for sharing this recipe. Tomorrow night trying your burrito recipe with the butternut squash. I had a lot of squash to use up so I am so glad I came across these recipes of yours. Thank you again! Can’t wait for my husband to get home from work to try this dish. 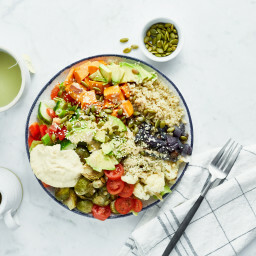 Hi there :) so I cannot find nutritional yeast, do you think its possible to use xanthan gum in place of nutritional yeast? My 2 year old had fifths! Just making this now and I reduced the fat even more by by cooking the squash in the crock pot. Scrubbed, popped in whole on low for 8 hours and bingo! So much easier as no difficult choping and peeling involved. Just scoop out the flesh when finished! The sauce is amazing!!!! Thank you! Hi! I love your cookbook! I was planning on making this recipe this weekend and I have a couple of questions, first I was going to do half pasta/half cauliflower to help cut back on carbs, do you think that’s ok? Also, I really like Mac and cheese that is baked and crispy on the top do you think it would mess up the cheese/recipe if I threw it all in a casserole dish and popped it in the oven on broil for a few minutes? Thanks for all your hardwork and sharing such amazing recipes!!! If I don’t use nutritional yeast does that change the flavor? Never used this before, not sure how it contributes to the recipe. Yes it will change the flavour. The nutritional yeast gives it that cheesy taste. Love this recipe. My kiddos could eat the entire pan themselves. Have shared it many times with friends and family. The roasted squash was so delicious I was tempted to stop right there! But I’m glad I kept going. The bright notes from the mustard and lemon juice are lovely. Personally, I might cut back on the yeast just a bit. Thanks for a great recipe! I’ll be making this for a second time tonight. My boyfriend can’t eat nuts, so I am very happy that there is a nut-free vegan mac n’ cheese alternative. Yukon gold and doubled the recipe. I threw frozen broccoli in with the pasta after it was done cooking. Then drained and combined. Perfection! Thank you, as always, for helping me feed myself and my family with delicious, healthy food. Has anyone ever tried smoking this recipe in a wood chip smoker? I make this recipe all the time and LOVE it–every time I have served it in the dining hall where I work, people always rave about it and can’t believe it’s vegan! (Thank you Angela!!) I have been asked to try smoking it in our new smoker and am wondering if anyone has experience with smoking vegan mac & cheeze. I’m thinking I would want to add extra sauce/milk to ensure it stays moist as it smokes since it is fully cooked before it goes in. I made this tonight and oh my god it was so good!! I added some fresh parsley and smoked paprika to the sauce. Thinking of roasting some garlic with the butternut squash next time and blending it with the sauce. Thanks! i used this recipe tonight for dinner for me and my partner and goodness we were pleasantly surprised! As both of us are omnivores we were slightly dubious that it could taste as good as the macaroni and cheese we are used to, but this recipe surpassed all our expectations. And the fact that we were able to make it gluten free was a real bonus. It’s definitely brought us one step closer to a vegan lifestyle! Not bad! I sense it may be even better baked in the oven with broccoli and bread crumbs. Thanks for the recipe. This looks SO good! Thanks for sharing it on Vegan and Veggie Parents on Facebook. Definitely will give this a try. Mac and Cheese is one of those comfort foods we have difficulty giving up. I hope this will prove the replacement that we love even more. Oh my god. This is INCREDIBLE. Weirdly enough, the sauce almost reminds me of deviled egg filling in the best possible way. I could eat this sauce on anything. Thank you so much for this! YUMMY! I’ve been eating the leftovers all week and I am still not tired of it… Which is saying something! I added sautéed spinach and leek, and almost doubled the squash quantity. been craving BNS mac n cheese, making this this week! Hey this looks awesome!! Thank you so much!! Hi! I was just wondering if you knew about how many calories this yields? I’m on a 1000 calorie a day diet for health reasons and would like to make this but can’t go over about 250 calories for a serving ( 1 cup). Any ideas how to tell calories? This “cheese” sauce is brilliant! I had to stop myself from eating it straight out of the pot. And the butternut is a delicious addition. Yet another magical oh she glows recipe. Thanks so much Angela!. I thought you should never use olive oil for roasting, nevermind extra virgin. This was so stupid good! My 16-month old ate three servings in one sitting! Once again, a simple fast recipe that is also delicious! I keep passing on your recipes to one of my colleague, and it’s always a success with her family! This sauce tastes amazing, i can’t wait to eat it for supper! We love this! I was wondering if u had the nutritional info for this recipe. So happy you enjoy the mac ‘n cheeze, Breonna! Unfortunately, I haven’t calculated the nutritional info for this recipe, but there are great online tools like NutritionData or CalorieCount.com that can help you find out what you want to know pretty quickly. Hope this helps! I must give a critical review here. I followed the recipe exactly, using roasted butternut squash, and we threw the sauce away. The taste was very strange – somewhat sweet, somewhat sour – not at all appetizing. Even the odor was unpleasant, causing my daughter to ask if we had to eat whatever was creating “that smell”. I’ll stick to my other vegan mac & cheese recipe. Thank you so much for the recipe. My 6 year old picky boy loved this recipe and asked me twice already to make it again. Oh my goodness! I am in LOVE with this sauce! I am not vegan, but I love to find ways to use fresh produce and incorporate “healthy eating”. In my last co-op produce bag, there was a butternut squash that no one in my household was going to touch. Then I found this recipe and was intrigued. After making and tasting the first batch, I loved it so much that I promptly made a second batch to give to a vegan friend! Because I still eat cheese, this doesn’t taste as “cheesy” to me as some, but it stands alone on its own as a rich, delicious sauce for anything that sauce enhances! Well done and thank you!! I’m so glad you enjoyed the recipe, Brandy! :) Thanks for the lovely comment. A quick and easy way of to roast your squash for this recipe is to cut your squash in half, scoop out the seeds then place cut side down in a baking tray, pour in 100ml of water and bake for an hour at 200 degrees c. Then the squash is really soft and you can just scoop it out for the sauce! I’ve made this before and it was great. Decided to try it out on my picky toddler and SUCCESS! He gobbled it up. I’m ever so thankful. Great news, Alicia! So glad the recipe was a hit with your little guy. I absolutely LOVE this recipe! I use it in vegan lasagna and drizzle it on every layer as well as the regular old mac and cheese! My family loves it as well, and we are grateful to have found a lower fat version to the cashew cheese! I used coconut oil instead of the earth balance, and I didn’t have arrowroot, so I used a 1/4 tsp of guar gum and it still turned out perfect. SO YUMMY! Thank you! Hey Angela, do you know anything about canning? I usually make a huge batch of this suace and freeze the extras but I’d like to try canning it in jars. Thoughts on how long to water bath process it? Eureka! This sauce is perfection! It tastes so cheesy I can’t believe it. Thank you! Happy to hear it was a hit, Melissa! I really enjoy your recipes as I am not vegan but dairy, gluten, peanut intolerant. I am always looking for good dairy substitutes. Made this tonight with gluten free flour and it still became pretty thick. I was really impressed. Even with unsweetened soy milk it was still a bit on the sweet side so may add more spices next time. I’m amazed by the nutritional yeast! So happy to hear you enjoyed the Mac ‘n Cheeze, Edie! Also, I was really happy to see you added nutritional information. Macaroni and cheese it’s not. It looks good and tastes ok, but none of the non-vegan folks in my family liked it. It’s a little too time intensive to try again. I can’t tell you how flattered I am by this lovely comment, Nancye! Thanks so much for your warm words and support. Oh my gosh I tried many different version of this but this is by far the best!! I will keep using it for sure! Two thumbs up!!! Oh, I’m so happy this recipe was a winner, Amy! Thanks Angela! You have saved me countless times in pleasing people who aren’t vegan / gluten free …. this is long over due. Hey Paige, I would definitely recommend this recipe. It’s been one of my most popular recipes for years, and I recently (as in, just a couple days or so ago!) updated it. I think it’s better than ever! This was delicious. I added some nutmeg and some ground up cashews on the top and then baked it in the oven. It tasted almost like real cheese, without the guilt or consequences. This will now be in my regular rotation. Thanks, this was a great recipe. I look forward to trying more from Oh She Glows. I just made this and it was fantastic!! I through the sqaush into my Instant Pot for 5 minutes with a quick release. I also tossed some broccoli in with pasta when there was about 5 minutes left. With these short cuts I was able to make this in less than 30 minutes including boiling the water! This will be in regular rotation at our house. Well, this was an instant hit with my kids!! haha! They were eating (not eating) something else…then I finished making this, and said, “Hey! Try this! MmmMMmmmm!” and they totally ate it all…asked for more…..ate more…. Any tips for replacing almond milk? We have cashew and almond allergies.. but would love to be dairy free too. Thanks! Hi Lindsey, You can use a nut-free plant-based milk–just be sure it’s unsweetened and unflavoured. Hope this helps! 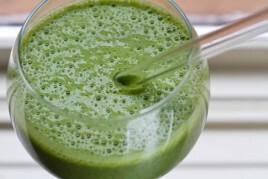 I use ripple pea protein milk (unsweetened unflavored) and it works amazing in this! I’ve made this recipe twice now. First time I L-O-V-E-D it! Second time, I finally found miso, added in two teaspoons, and now that’s all I can taste. Next time I’ll definitely leave that miso out. This was a hit! I didn’t use nutritional yeast and didn’t add vegan butter or cornstarch. I threw everything in a blender and it turned out to be just as delicious! I also used mushroom base instead of miso because I didn’t have it. So happy to hear that it worked out so well..thanks for letting us know! can I omit oils altogether? Hey Nicole, The oil/butter prevents the butternut squash from drying out and adds a bit of silkiness to the sauce. That said, I haven’t tried it without either of them so I’m really not sure! Sorry I can’t help you out more. If you try anything please let us know how it goes. I did, and loved the recipe too. See my comment below. Would tapioca flour work well with this recipe? Hey Alana, Hmm I’m not sure as I haven’t tried it or worked with that flour very much. I would suggest looking online and seeing if it can be used as a swap for potato or cornstarch? I make this at least once a week now. Tonight I subbed it out with pumpkin and put it in a lasagna. Oh my! So yummy. I usually sub water for milk too and it’s delicious. Thank you for making this. Tried this, made it with roasted pumpkin (no oil) and replaced the milk with aquafaba -some cooked white beans slipped in too, making it super-creamy, so left out the butter – peas and pumpkin as add-ins. Absolutely brilliant, with just a slight dusting of almond parmesan on top. New favorite, definitely! Hi there! I can’t wait to try this recipe! Would it be alright to bake afterwards with a panko topping for a casserole-style mac, or would it dry out too much? Thanks! Hey Diana, It does dry out a bit with baking so I think you could bake it, but I probably would bake it for only 15 minutes or so (maybe 350F?) at the most. I’d love to hear how it goes if you try it out! Have you ever tried freezing the cheeze sauce? I love this recipe and it’d be so nice to eat it on the fly when I’m craving comfort food. I live on an island so I try to avoid using can goods to reduce waste! Hey Martina, I’m sorry I haven’t tried freezing this one before, so I’m not entirely sure. I haven’t tried freezing my all-purpose vegan cheese sauce (on the blog, in my second book, and app), and it thaws quite well (just a bit of a thicker texture after thawing). Please let me know how it goes if you try it out! We grew a bunch of kobacha squash so we used that instead of butternut. It was still excellent. Years ago we used to eat Pastichio which is a super greasy, cheesy pasta dish with pasta sauce on it. This inspired us to try your dish to make our own healthy Pastichio. We added fresh grated garlic and chilli pepper flakes to marinara sauce and served it on your Butternut Squash Mac’n Cheez. Fantastic!! I’d love to make this for my 1 and 3 year old but to make it easier I’d like to use canned pumpkin. Is the miso necessary? I don’t have that and would like to avoid buying it. Hey Nancy, the miso adds depth of flavour, but you can make it without…simply adjust the seasonings to taste. Hope this helps! This is the BEST vegan mac n cheese I’ve ever had, let alone made!!! I am eating it as I write this and thought it was too good not to say something. Three notes: I bought brewers yeast instead of nutritional yeast but did not add it because it is so bitter. I’m so glad I didn’t because with just the addition of miso (I added the powder kind for instant miso soup) it tasted soooooo cheesy!! So even without the right yeast, it was miraculously cheesy-tasting. Second, I folded raw kale and frozen peas through it over medium heat and it was delicious, not bitter at all. Lastly, I am going to quadruple this recipe and freeze half the sauce so I can reheat this on a busy weekday. It is a little more work than other dinners but so worth it so imma have this on hand from now on. Hey Jessica, I’m so happy to hear that it was such a big hit! Thanks for sharing how you served it too. Sounds so good! Tried this recipe tonight and LOVED it! I had some butternut squash sitting on my counter that I’ve been meaning to use up and was so happy to find your recipe! I didn’t have much nutritional yeast so I subbed in some cashews and didn’t add any miso but still turned out terrific! Thank you for posting your delicious yet simple creations!! Aww I’m so glad to hear this Erica. Thank you so much for trying it out! Hi- I’ve made this before and loved it. I’m wondering if I could make the sauce and freeze it? I have some extra cubed, uncooked squash and am wondering what to do with it? worked with kabocha squash beautifully, put on some kale and Brussels and couldn’t love it more. thank you. Three cheers for your fiancé going back for seconds…a good sign for sure, lol! So glad it was a hit Brittany. I was craving Mac & cheese and this was perfect. I bought cubed squash and boiled it at the same time as the pasta (in a separate pot). I used the whisk to mash it into the sauce so easy and no cans involved. I didn’t have miso on hand and never buy onion powder, so when I made this last week I found it a little plain, but with oh so much potential! I made it last night, still without miso, but sauteed onions, garlic, rosemary and thyme (my partner’s secret ingredients for his stupendous non-vegan mac and cheese), and a dash of nutmeg – and it was great! Probably tasted a little more ‘fancy’ than the intended recipe, but added a nice robust, flavour! Where do you find chickpea miso?